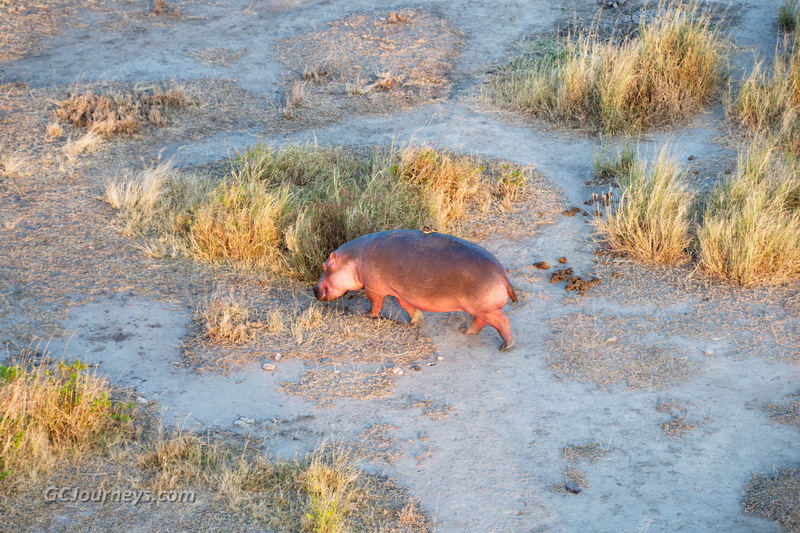 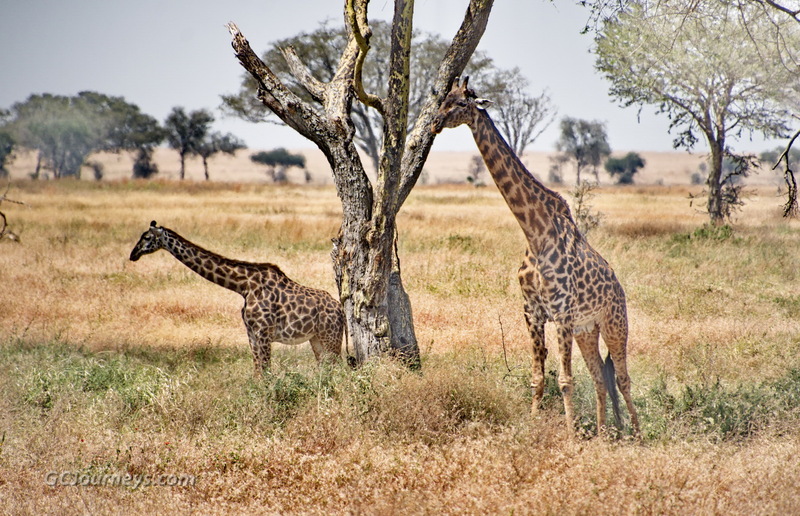 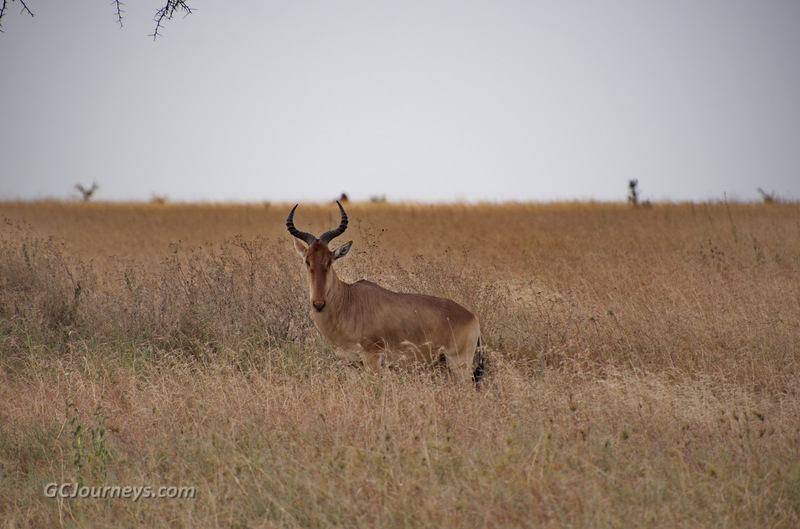 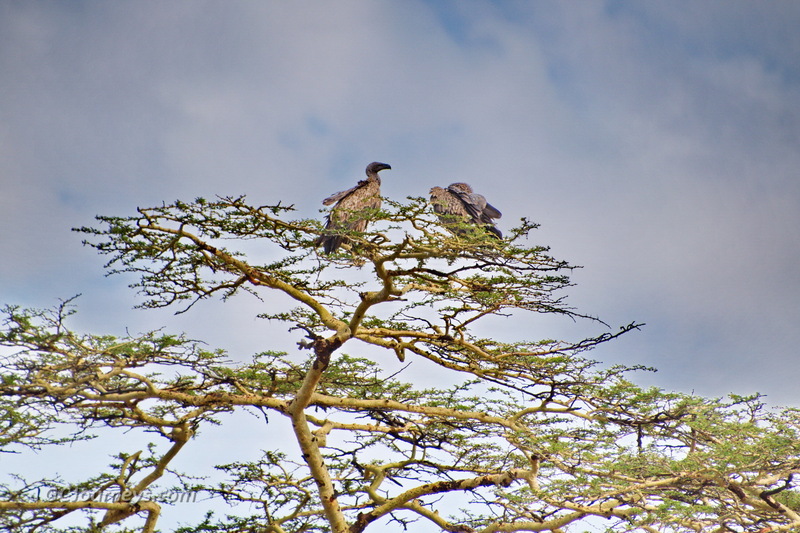 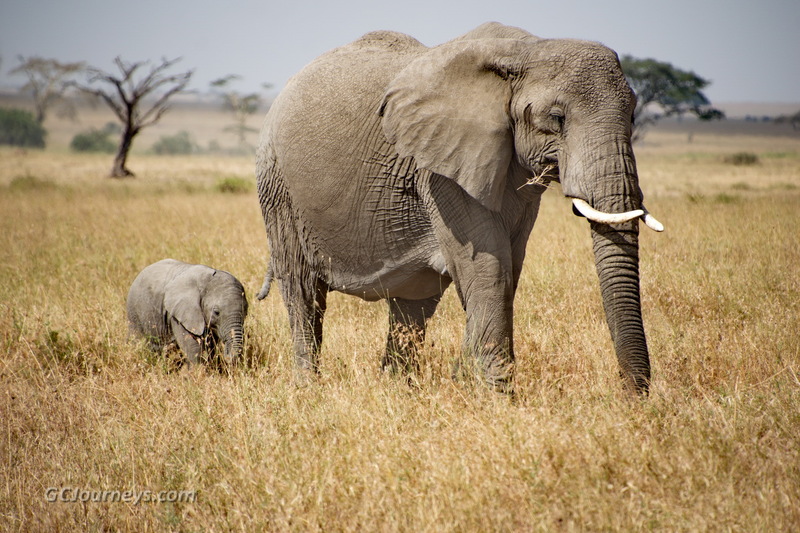 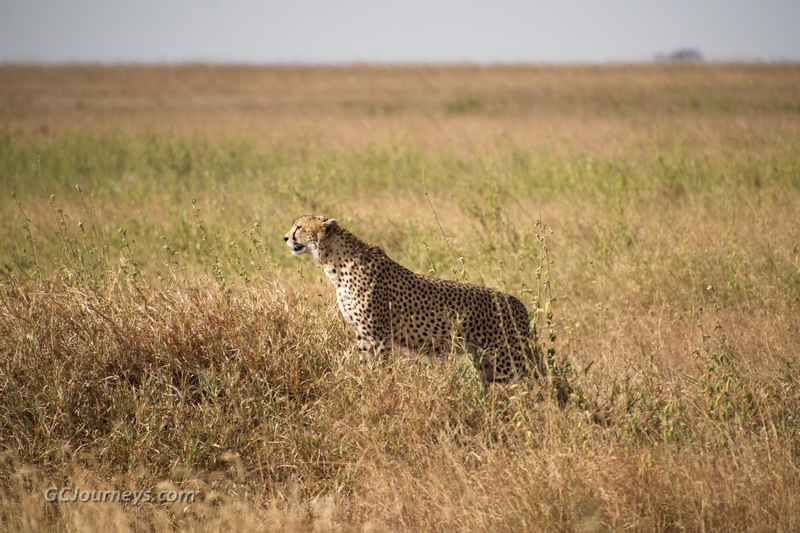 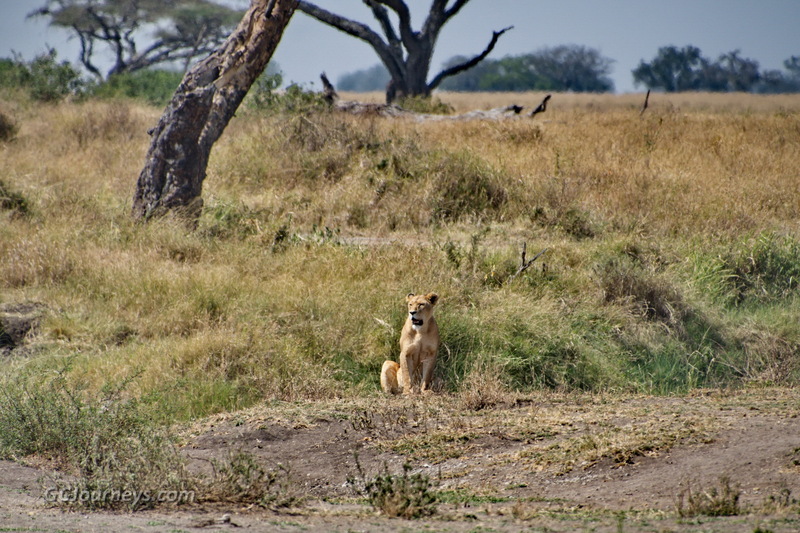 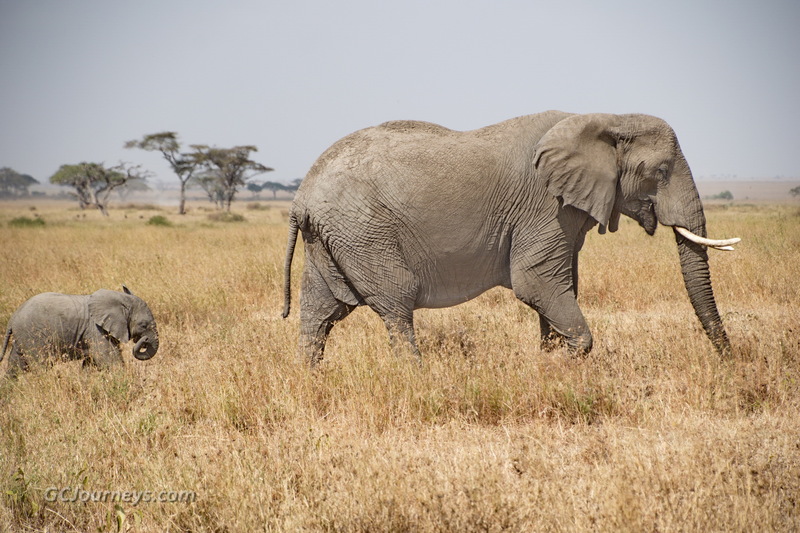 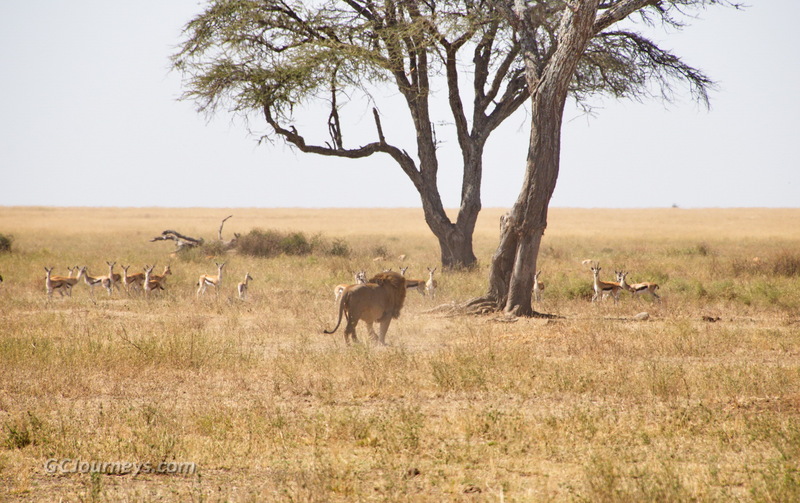 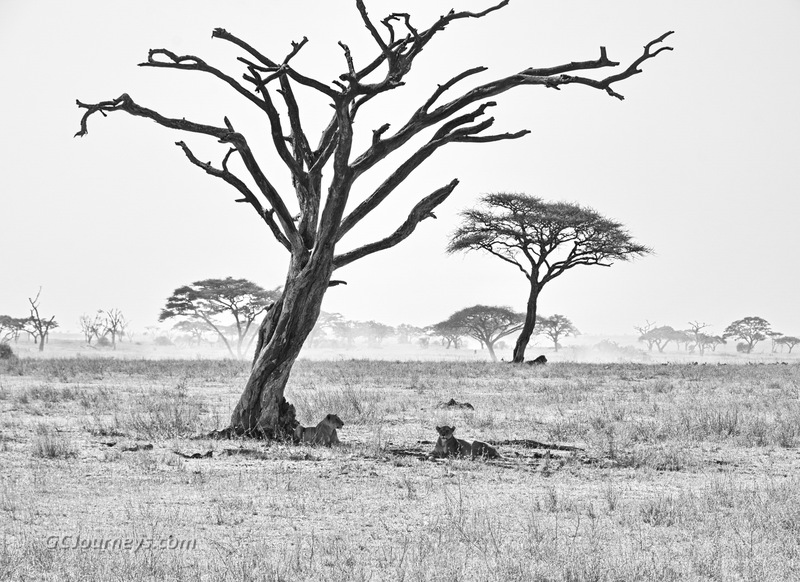 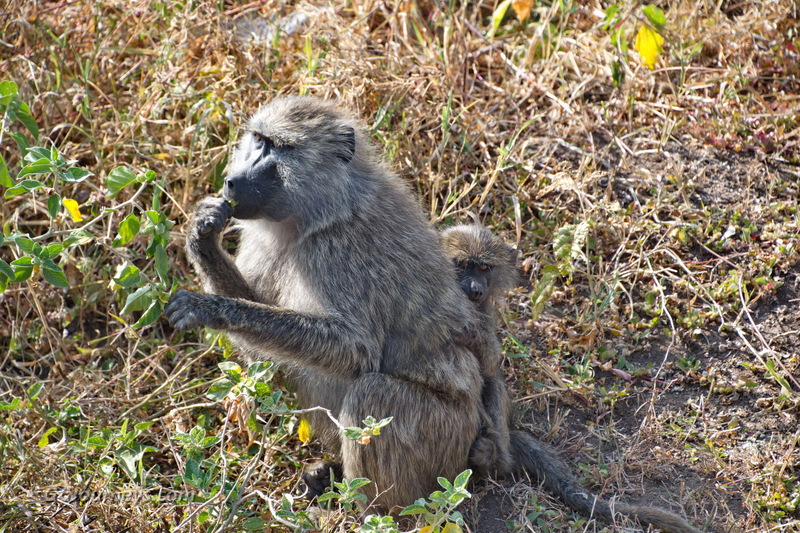 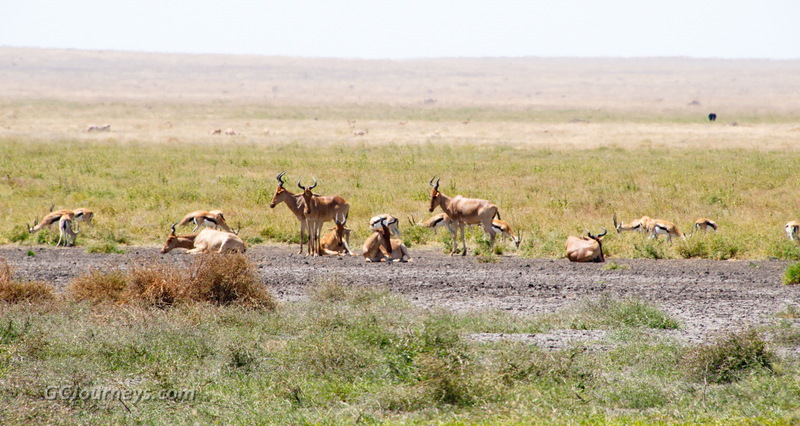 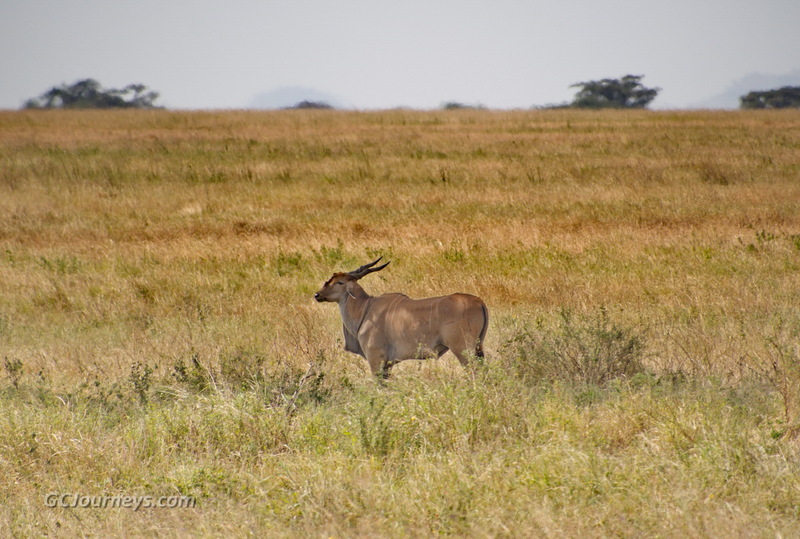 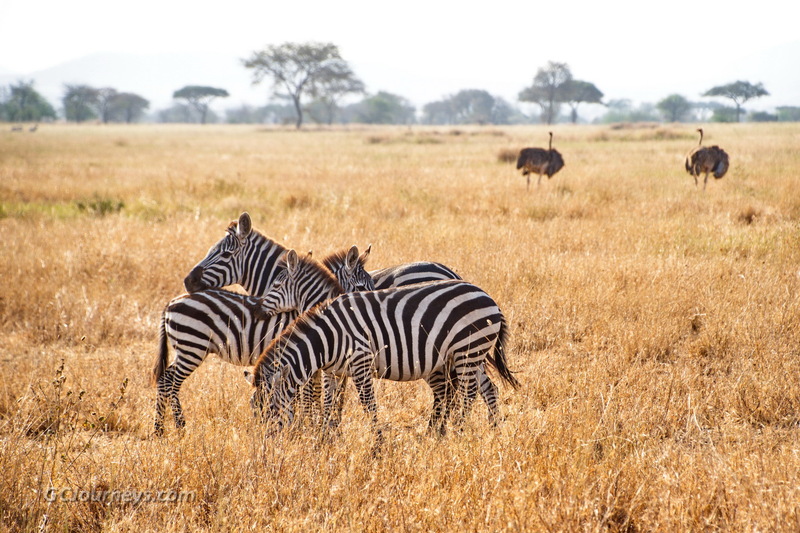 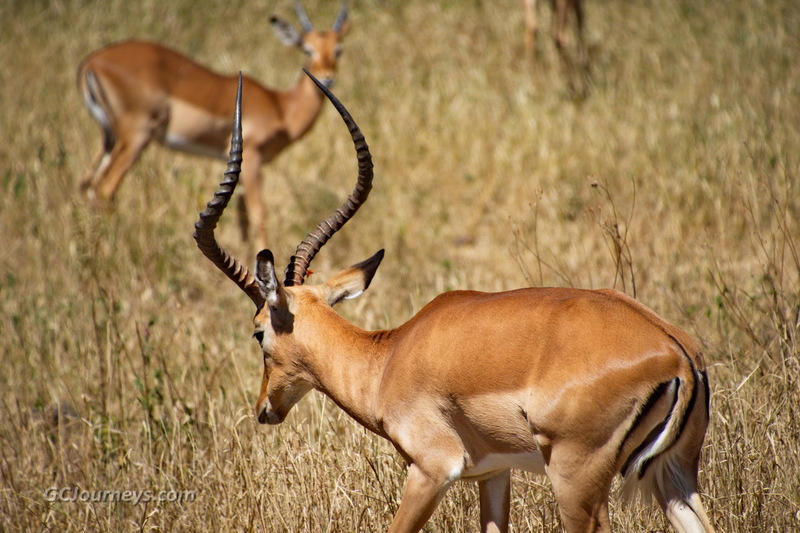 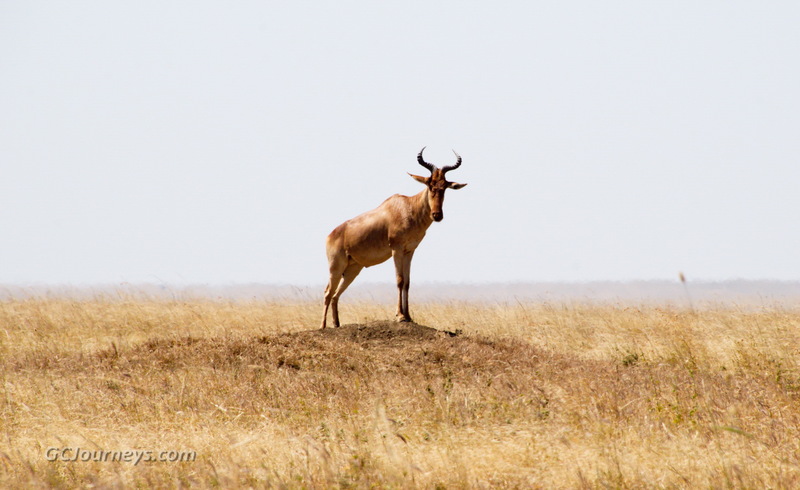 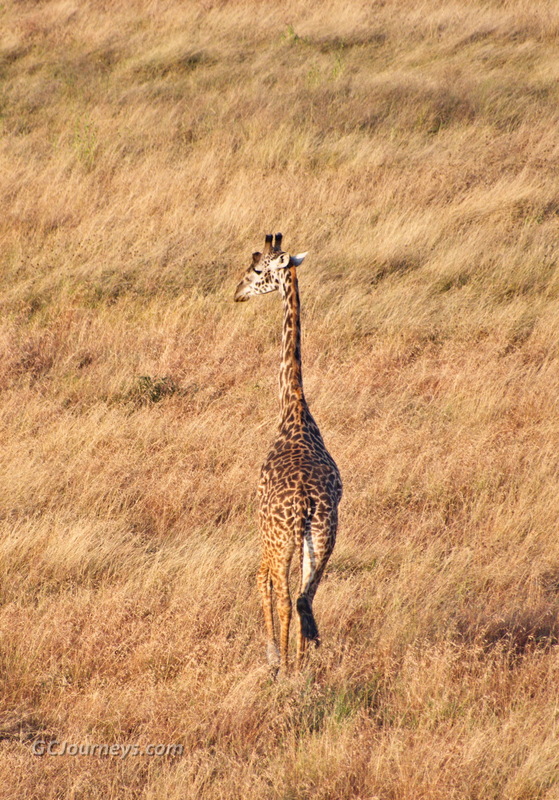 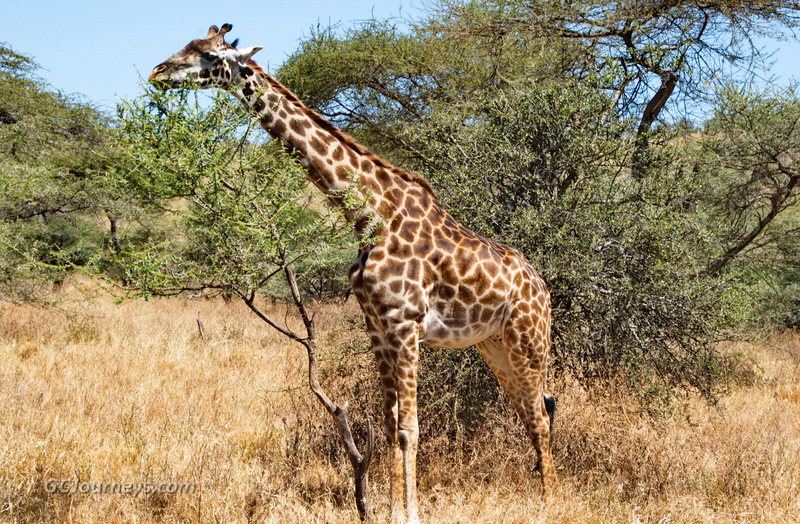 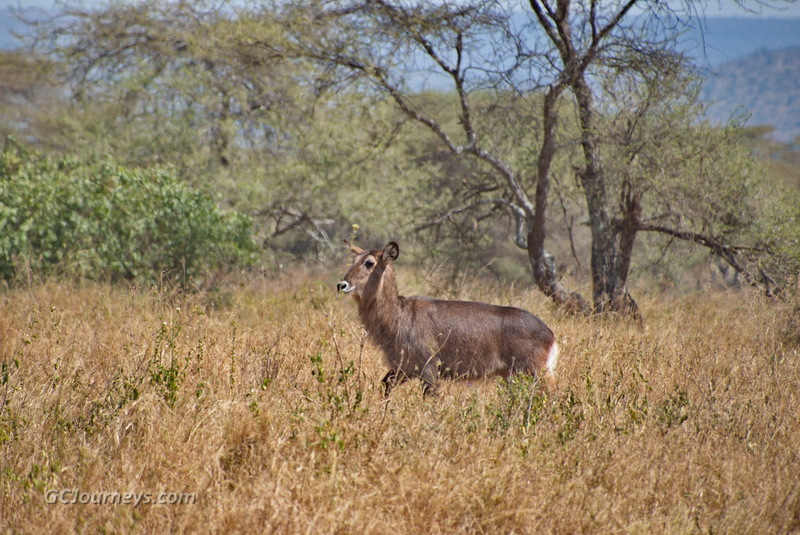 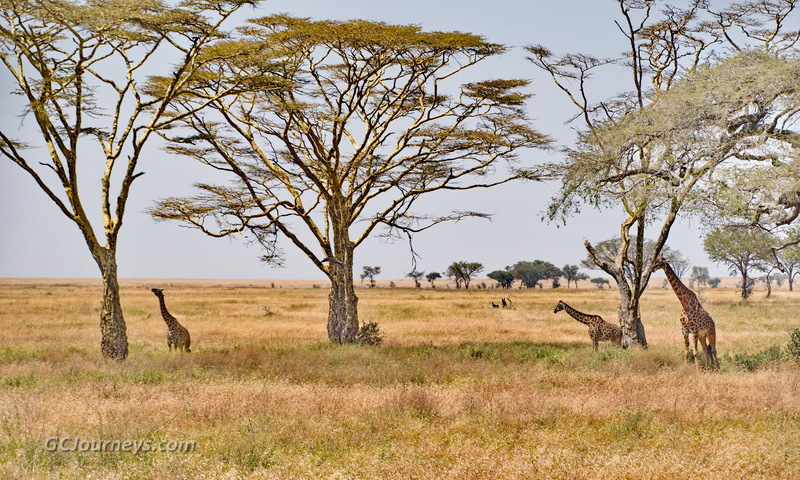 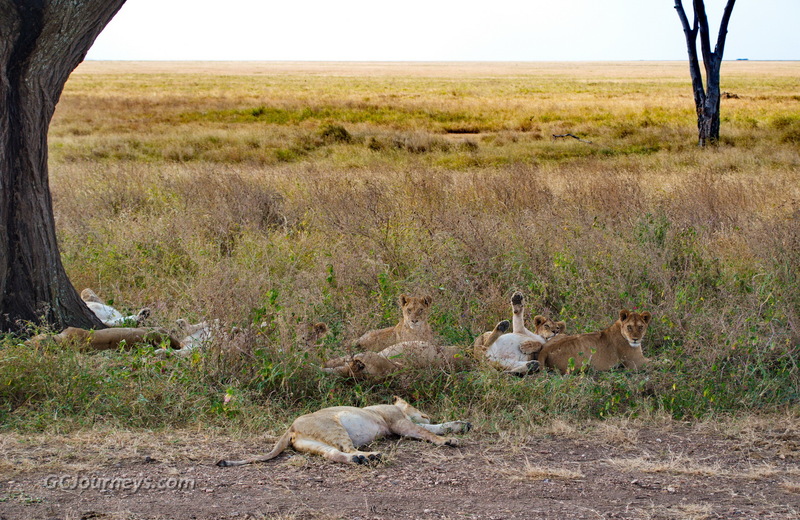 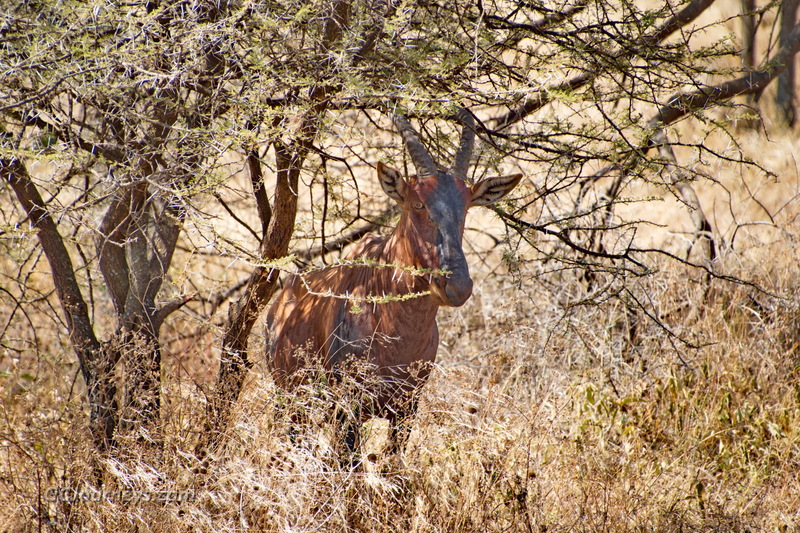 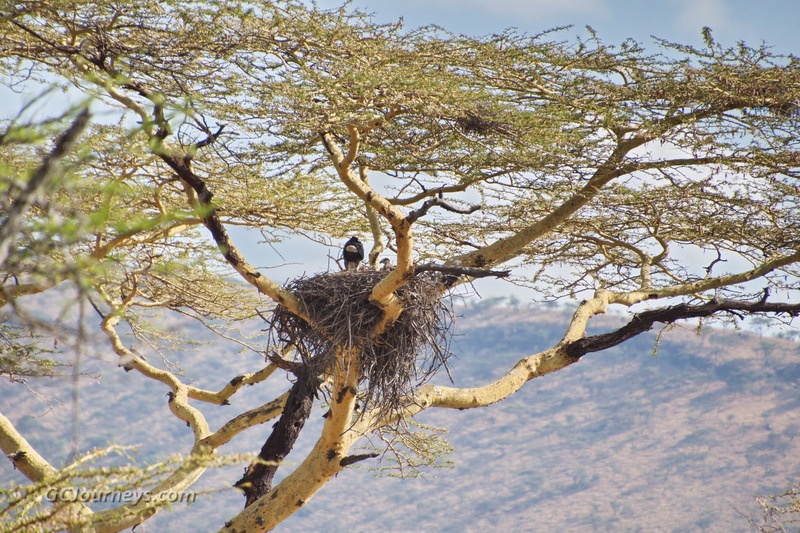 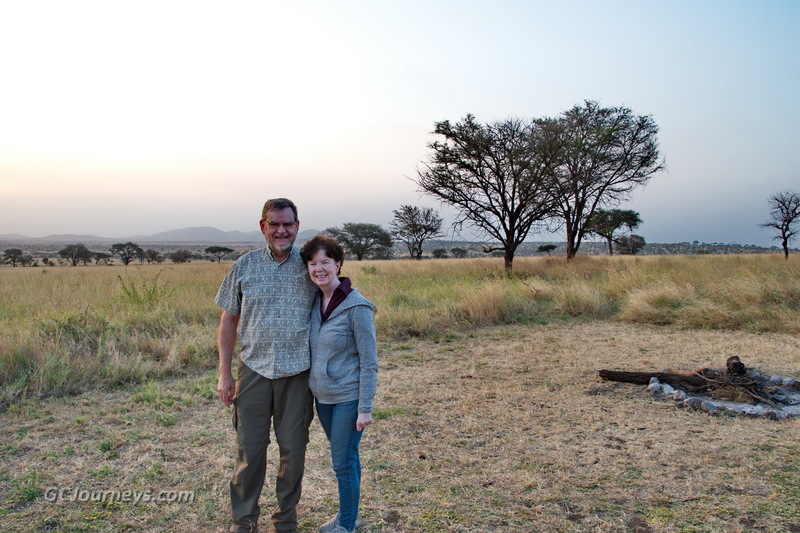 We saw lots of wildlife on our trip into and through the Serengeti National Park to our camp, including hyenas, hartebeest, warthogs, giraffes, impala, hippos, elephants, a lone crocodile, topi, ground hornbill, and a jackal. 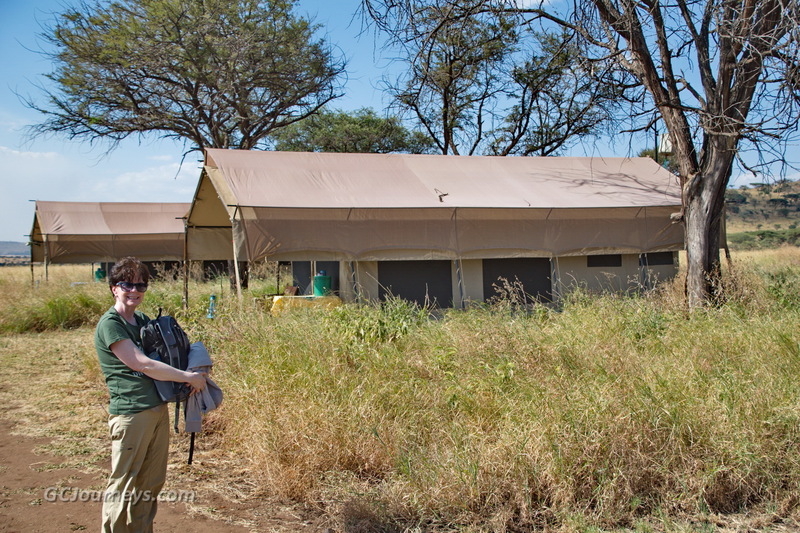 On arrival we settled into our tent accommodation for the next four nights. 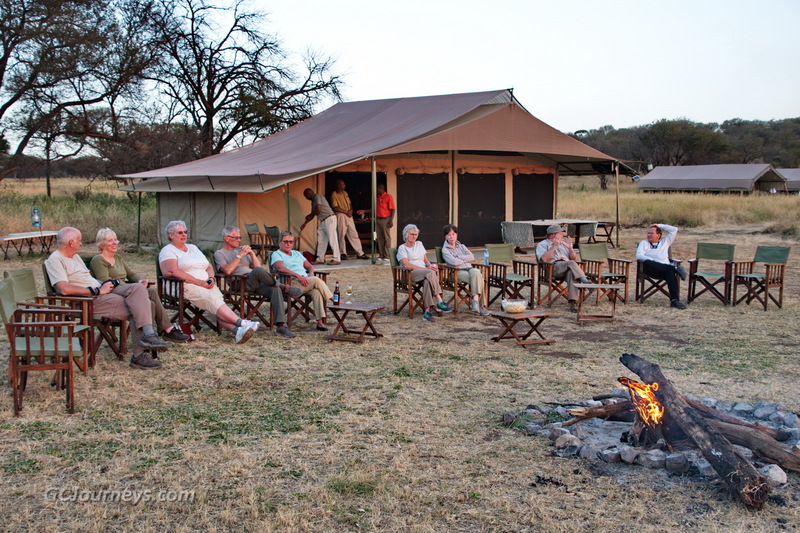 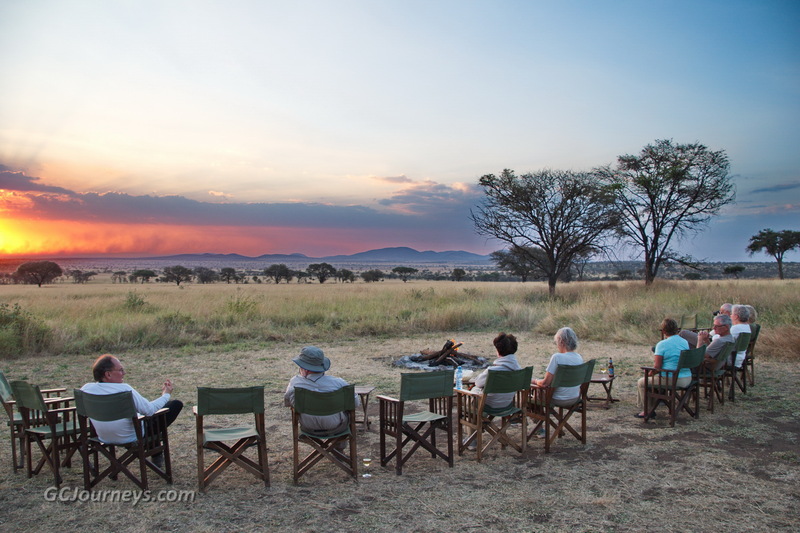 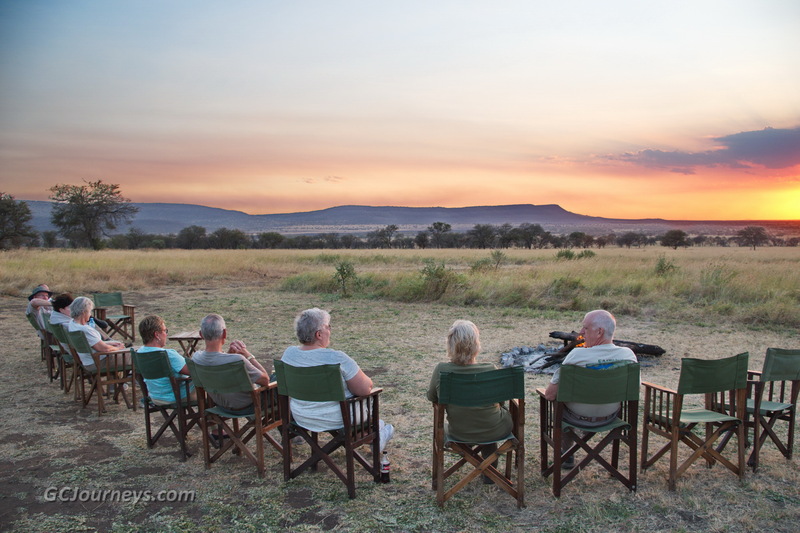 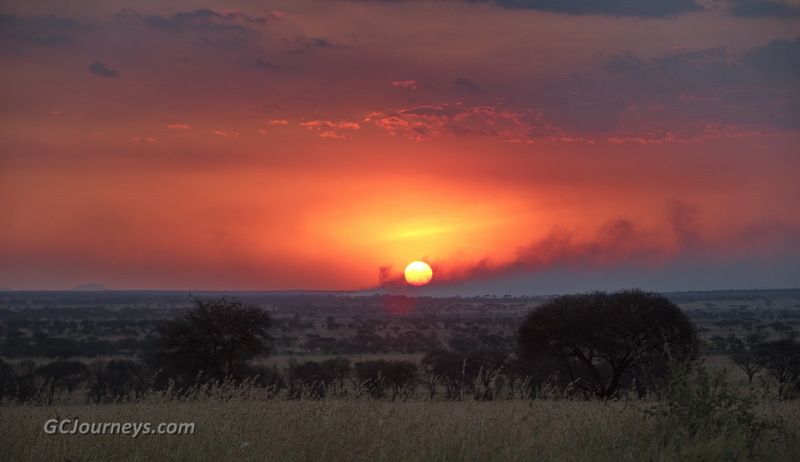 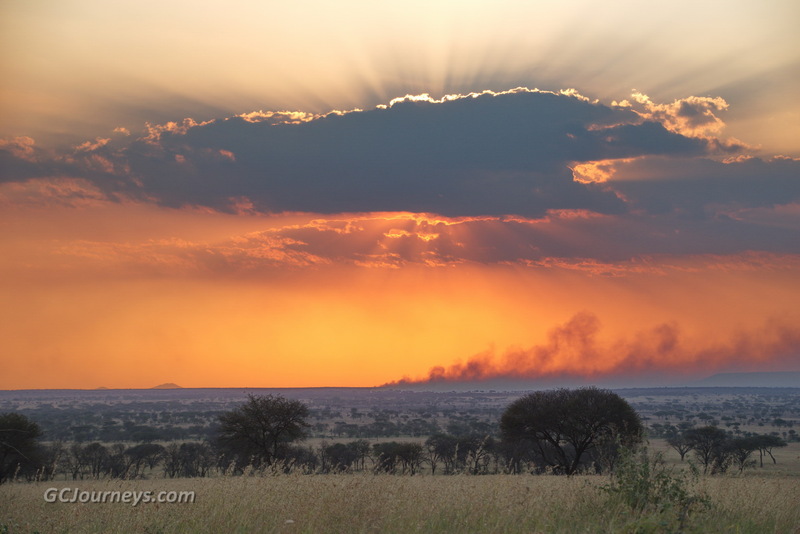 After dinner we gathered around the fire to watch a spectacular Serengeti sunset behind the smoke of a controlled burning in the distant grassland. 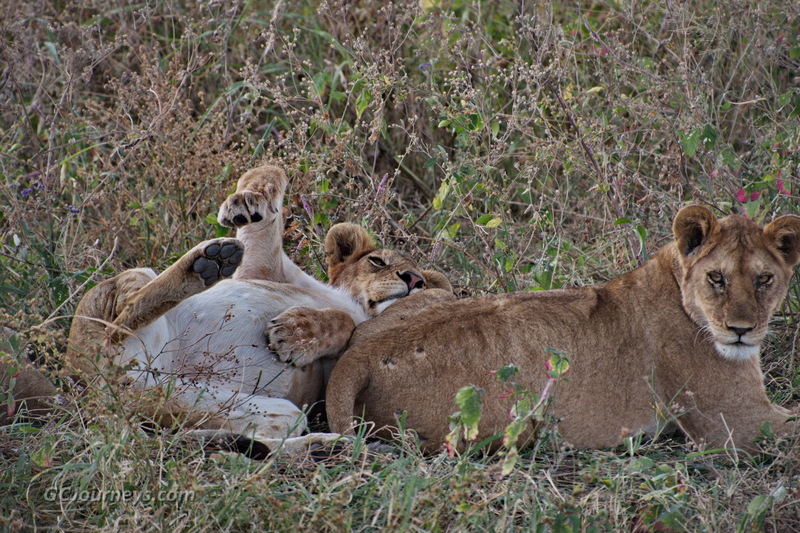 The next day started with an early-morning game ride followed by time to relax and catch up on sleep. 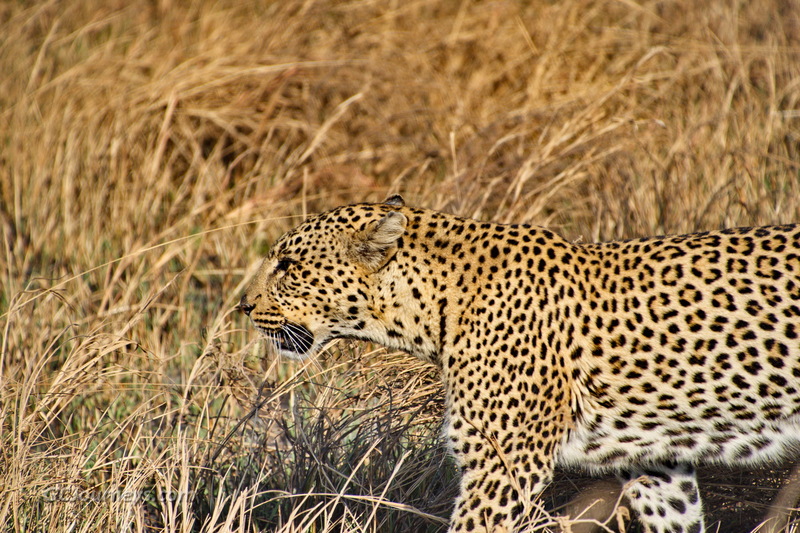 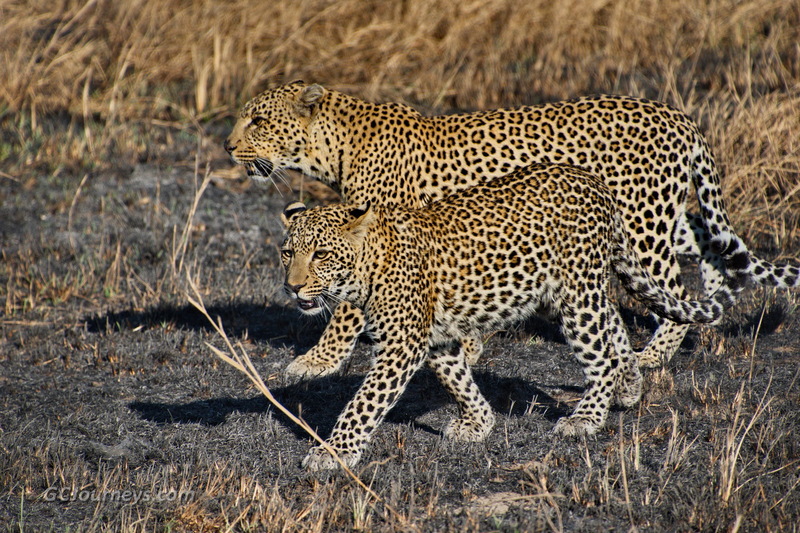 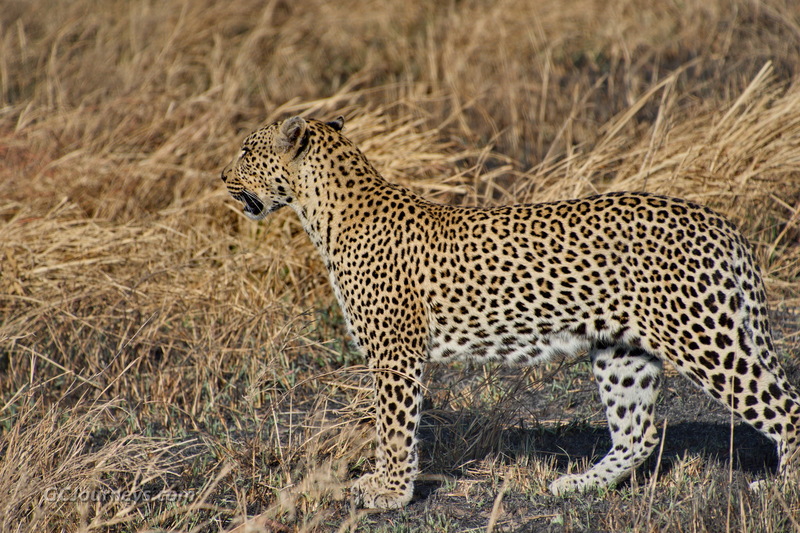 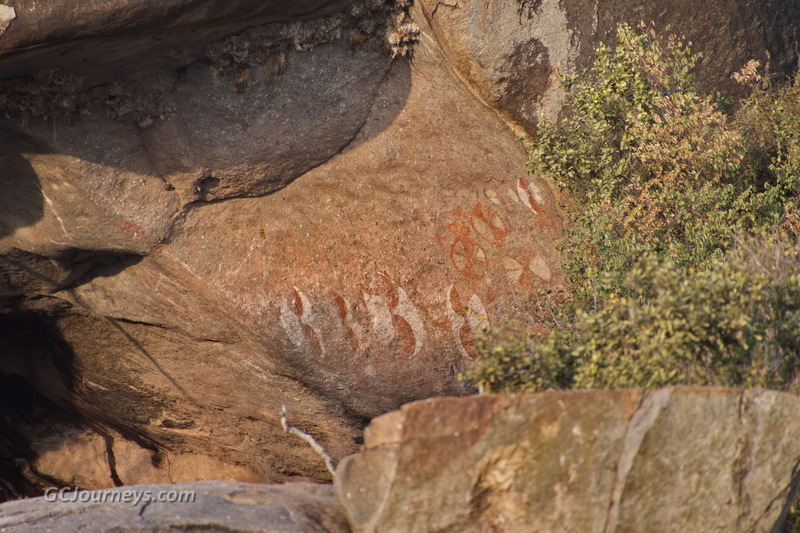 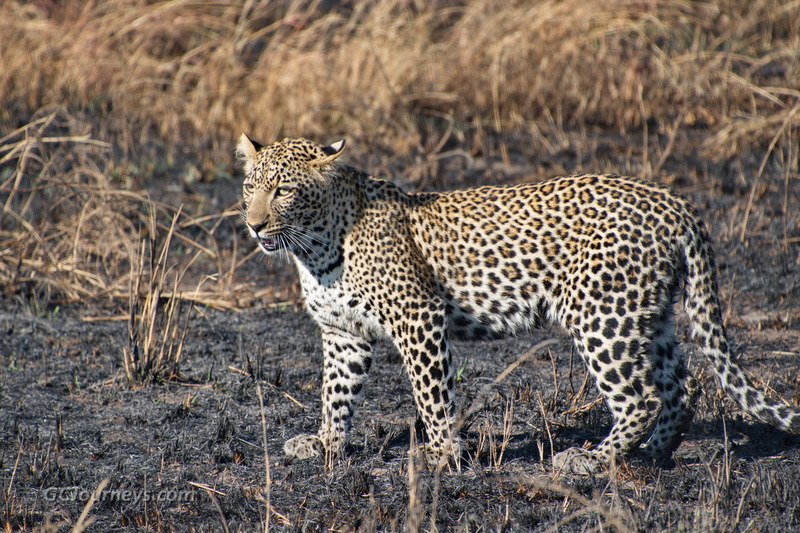 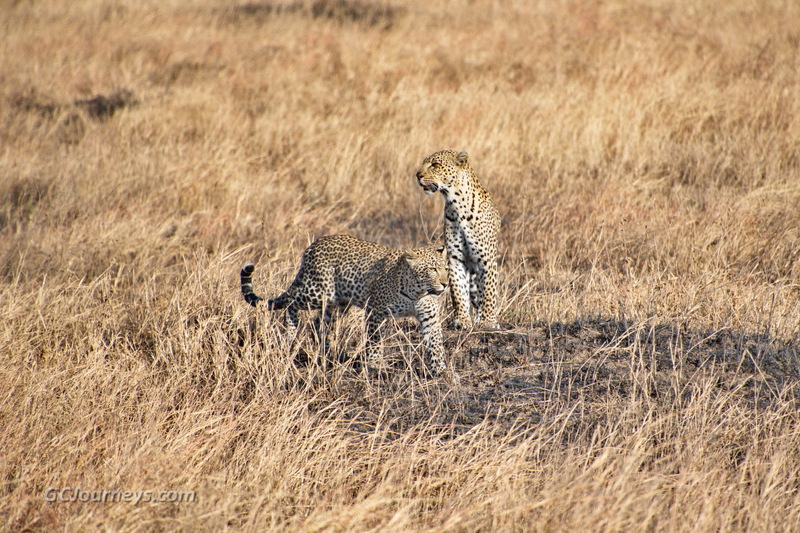 Highlights of the day were two leopard sightings and close encounters with male and female lions. 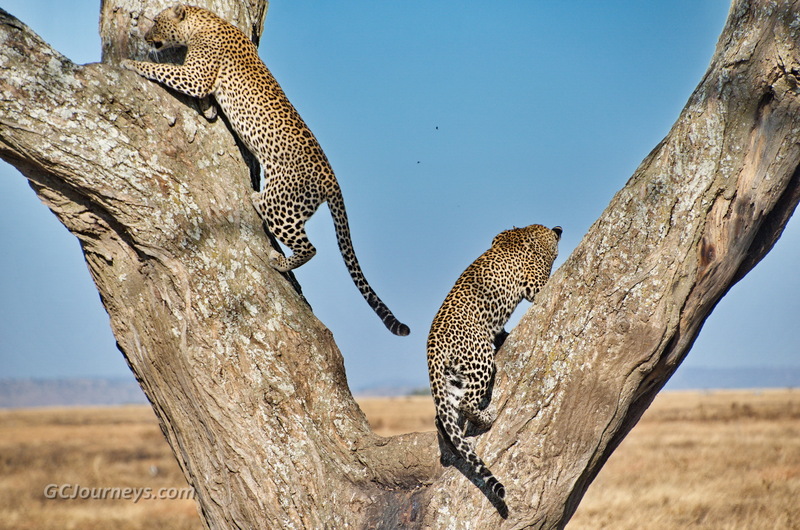 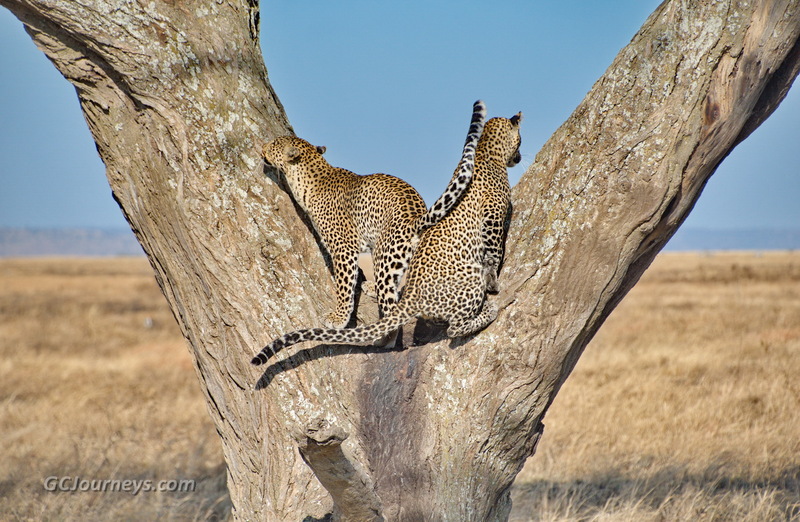 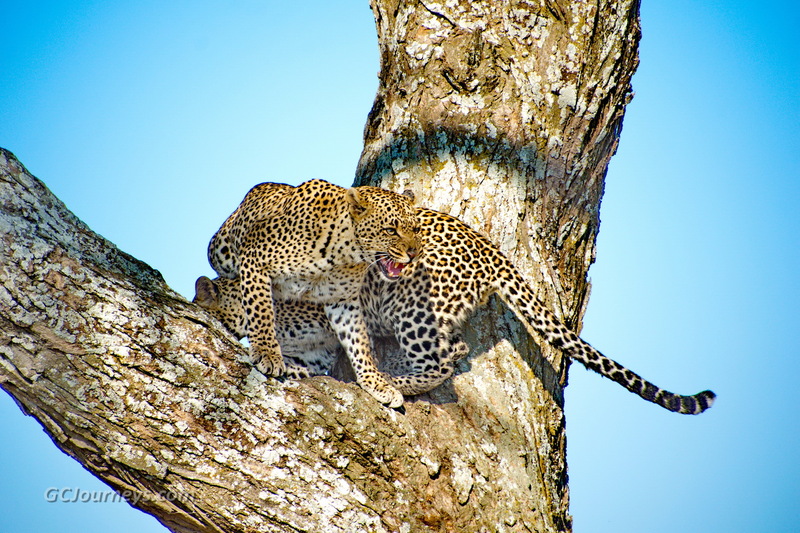 We followed a mother leopard and her offspring for several hundred yards, from barely visible in the grass to up close as they climbed a tree. 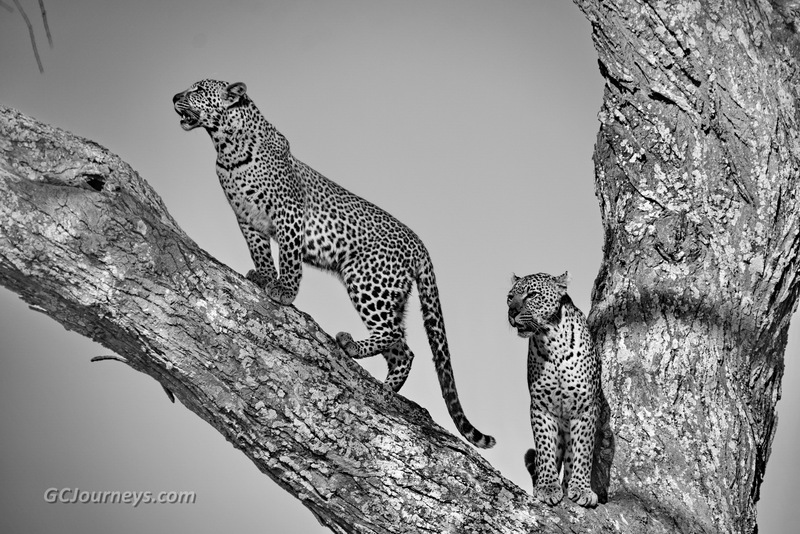 They both seemed to be performing for the camera and the photo opportunities surpassed all our expectations. 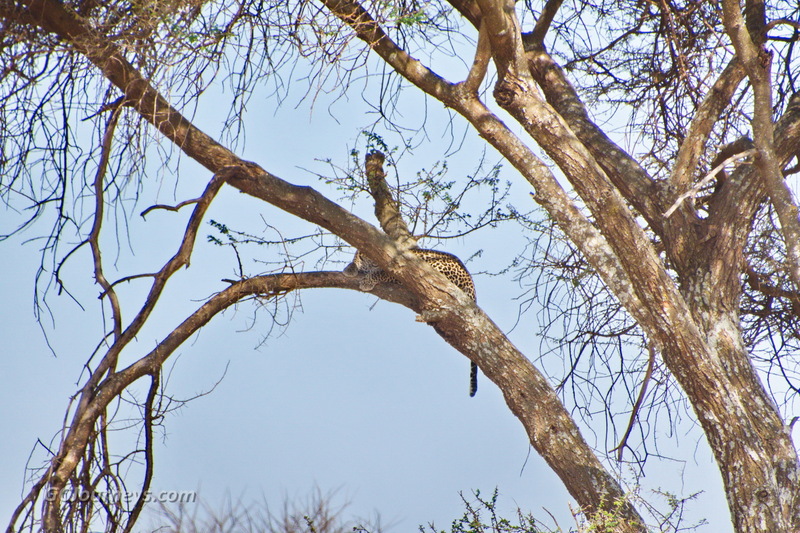 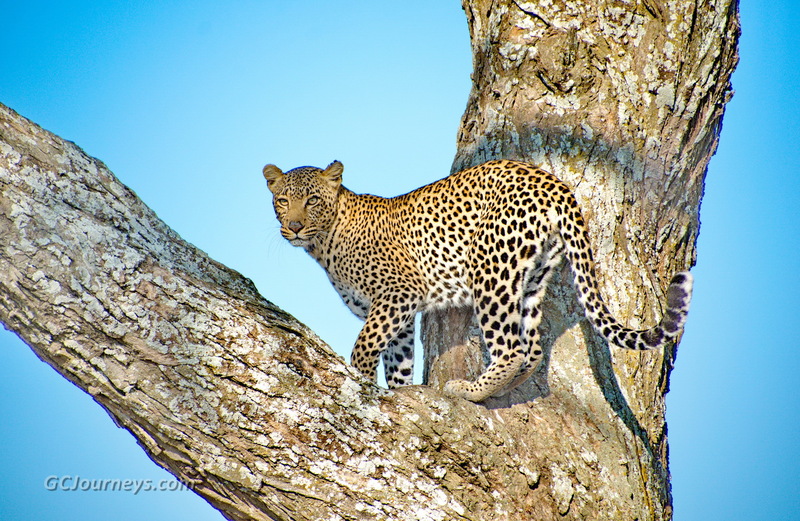 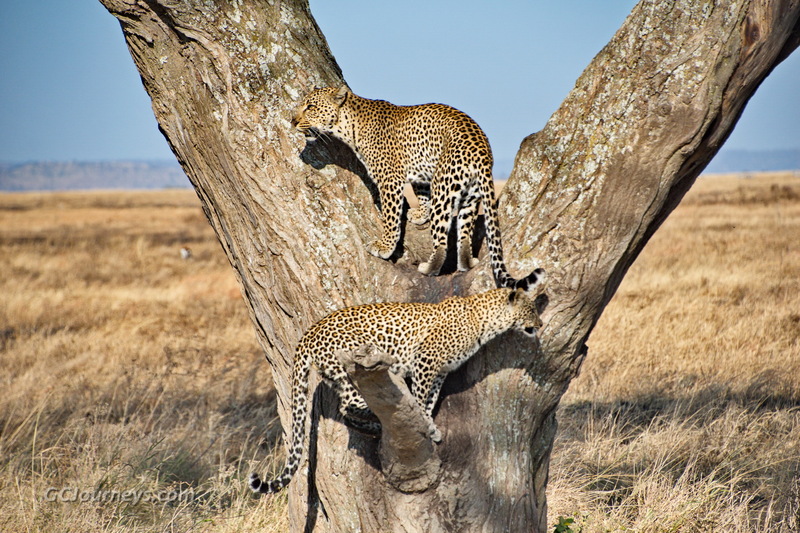 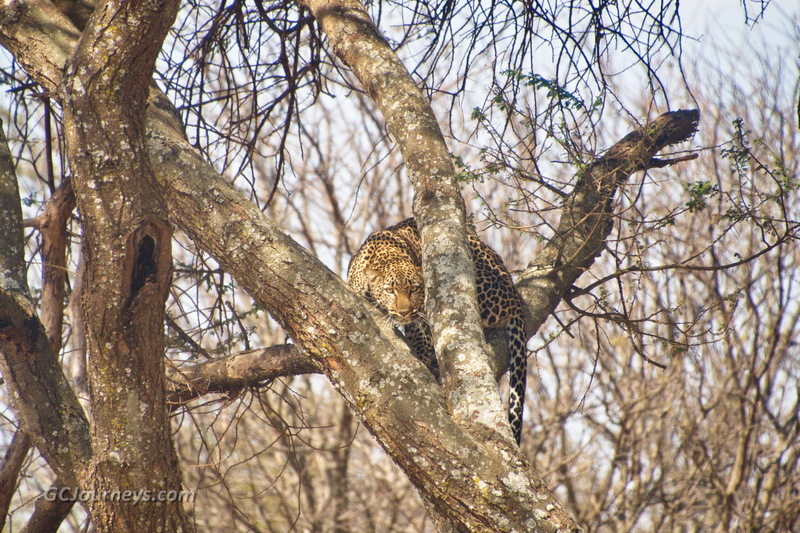 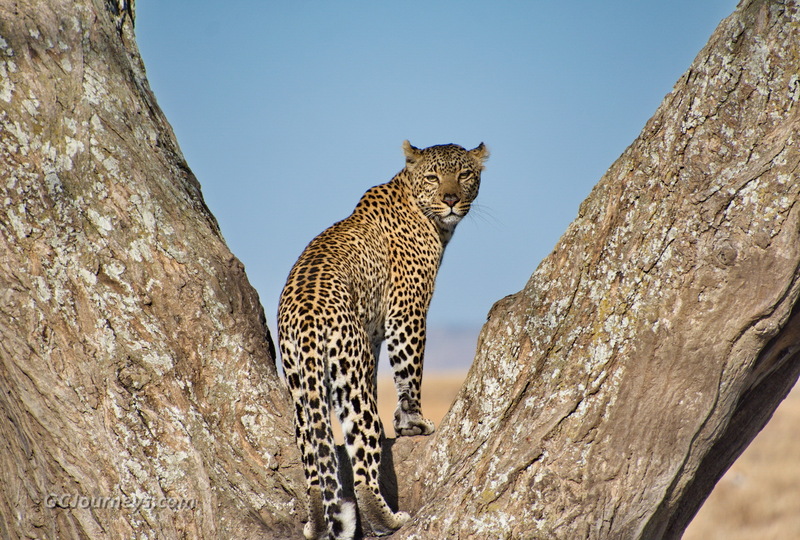 The second leopard appeared to be a little more suspicious of us as it watched us from its perch behind some branches. 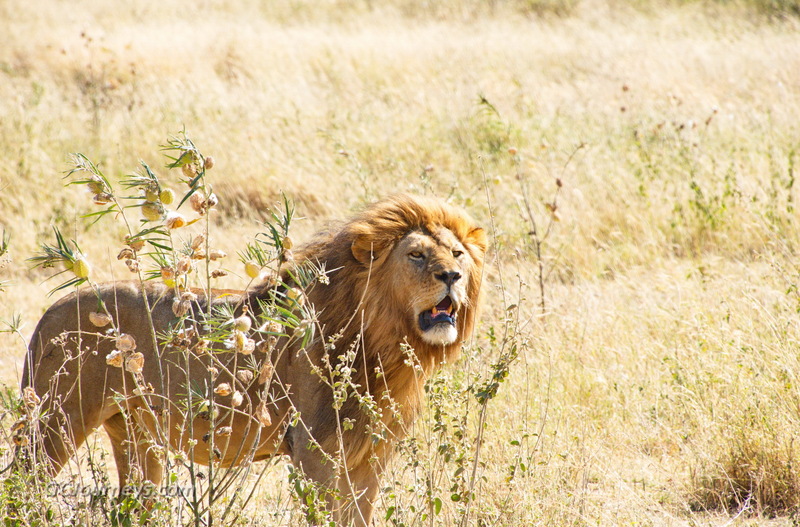 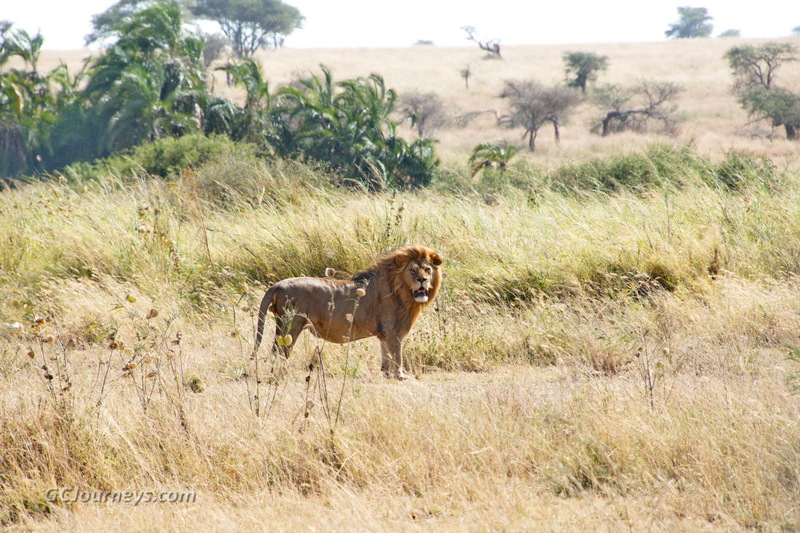 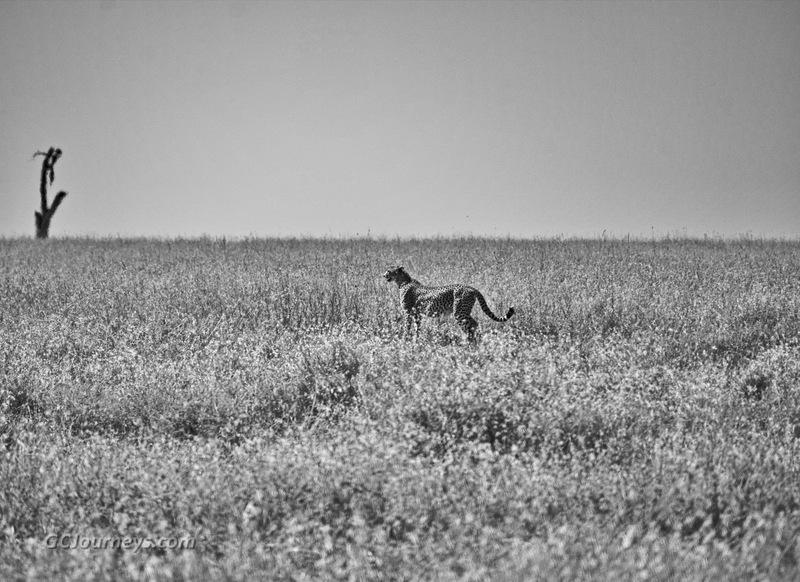 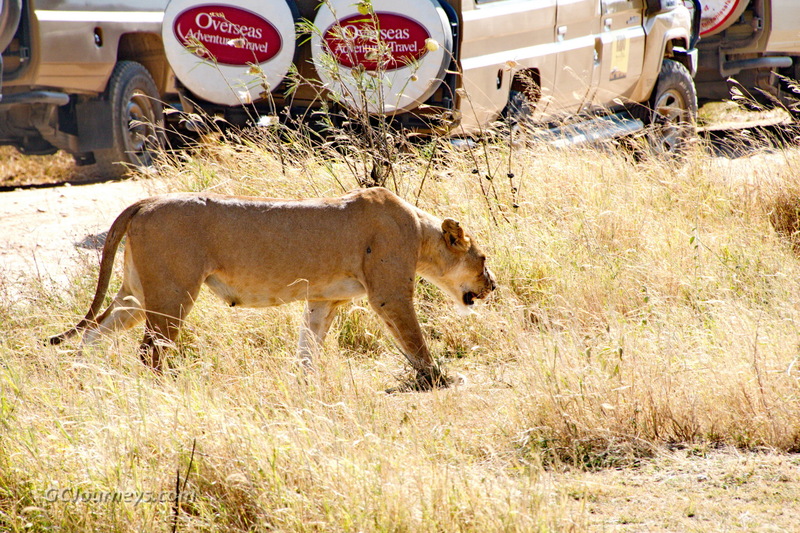 The lion pride made its way from a distant sighting to walking among the safari vehicles. 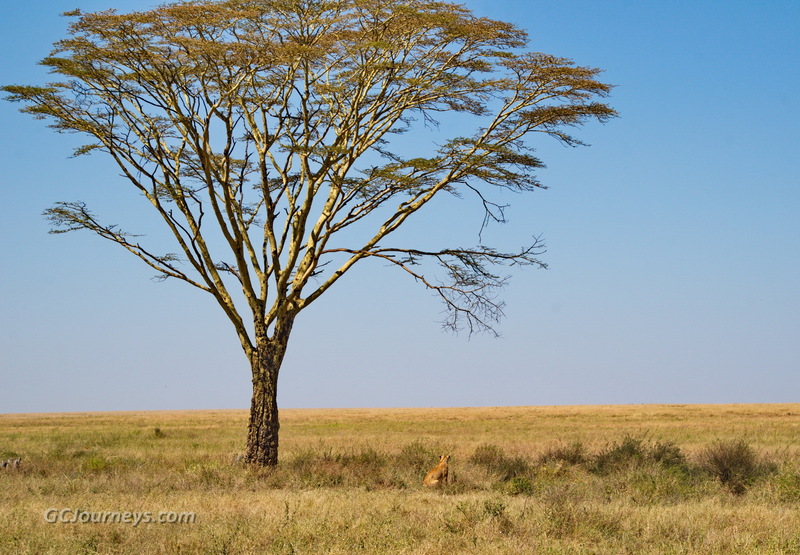 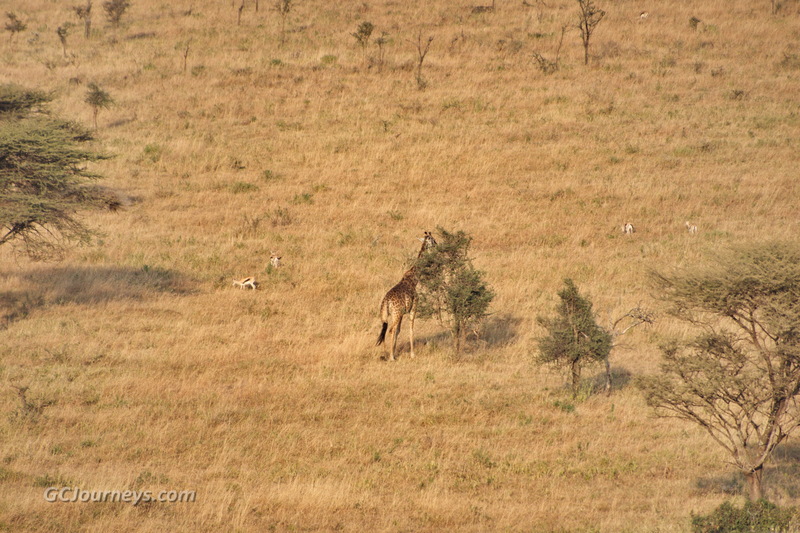 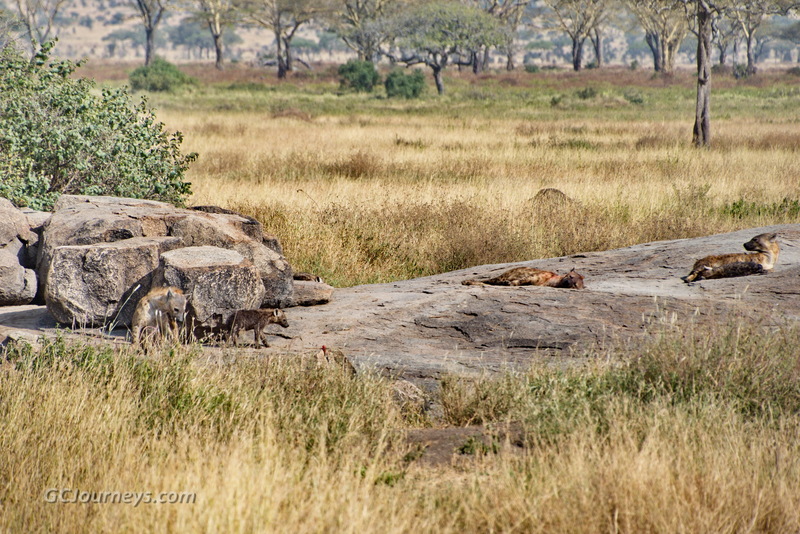 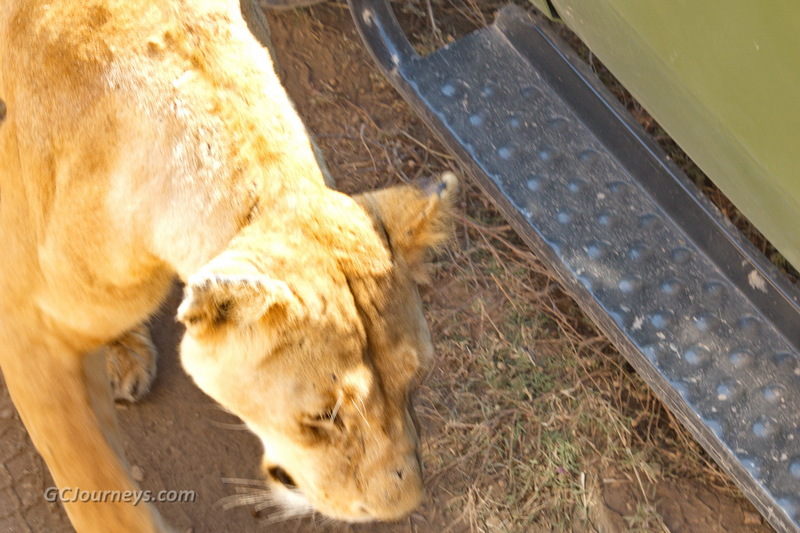 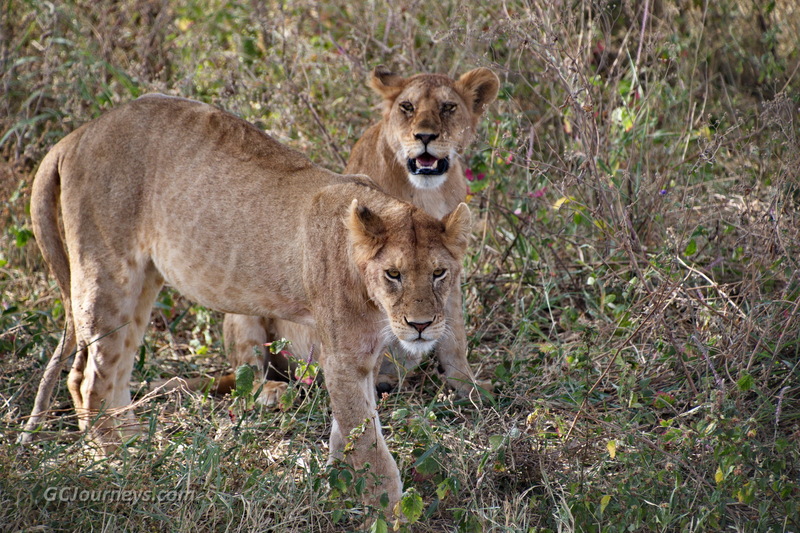 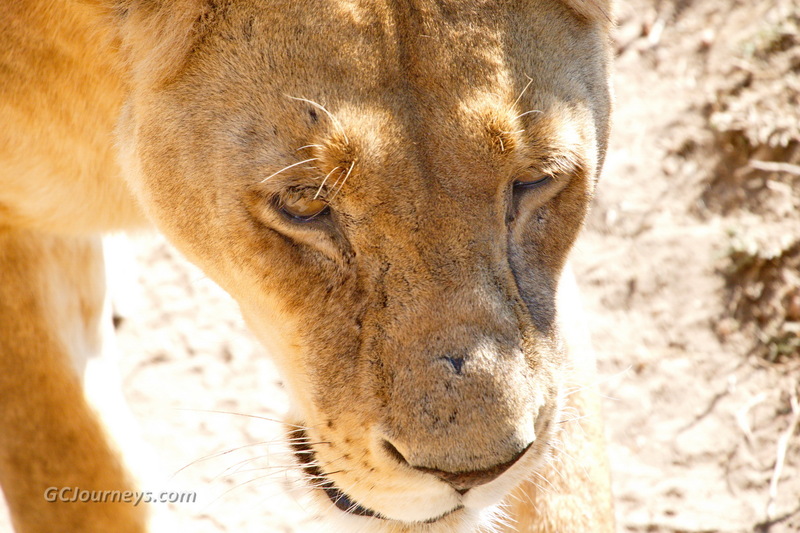 One lioness walked directly below my camera, brushing the side of the Land Cruiser. 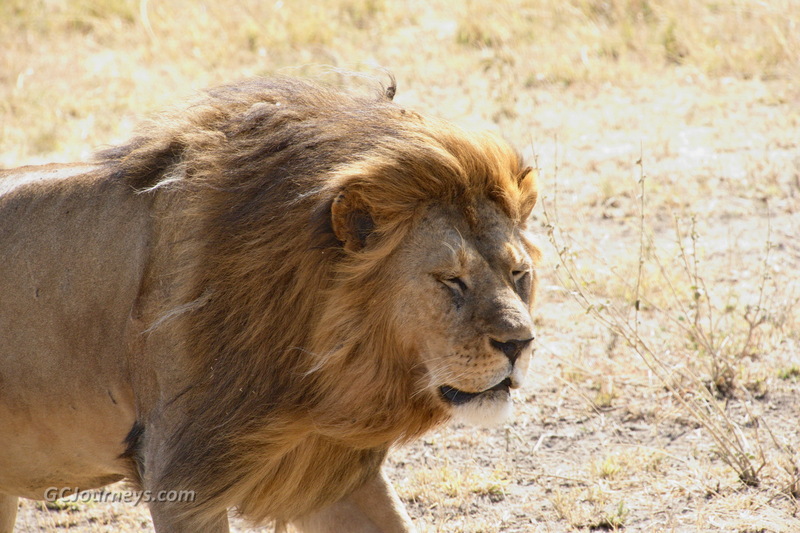 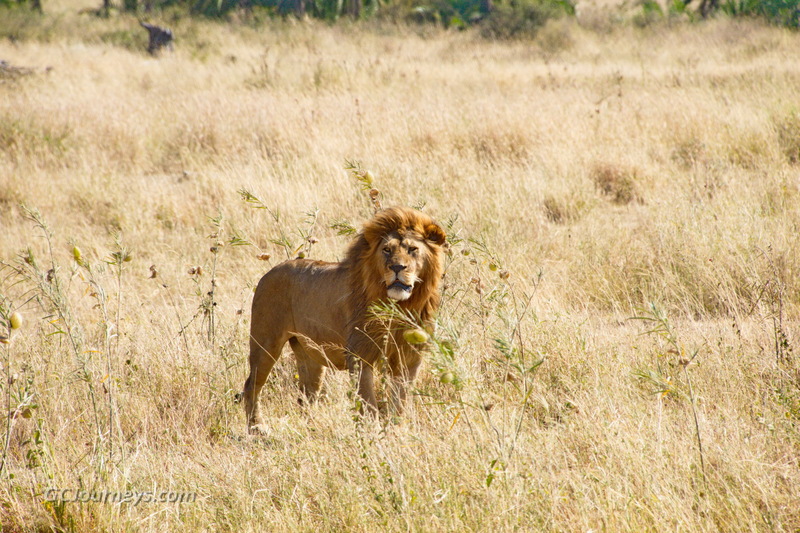 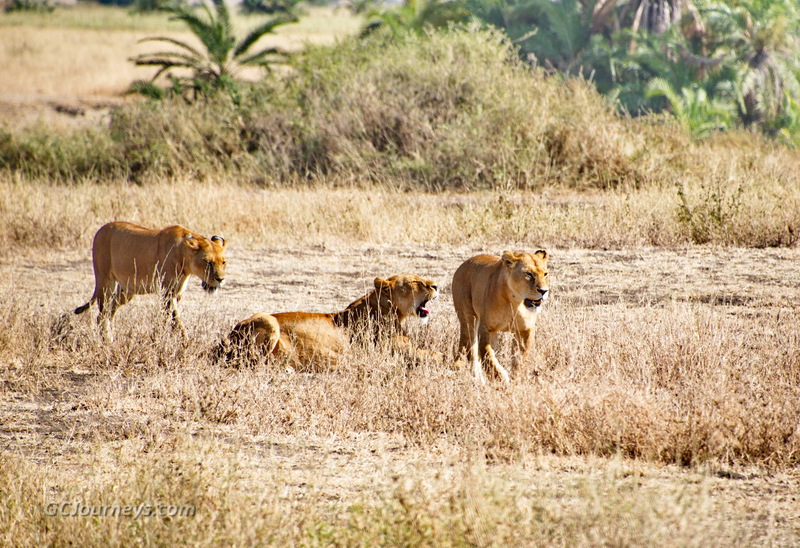 The male lion kept his distance from the females but never let them out of his sight. 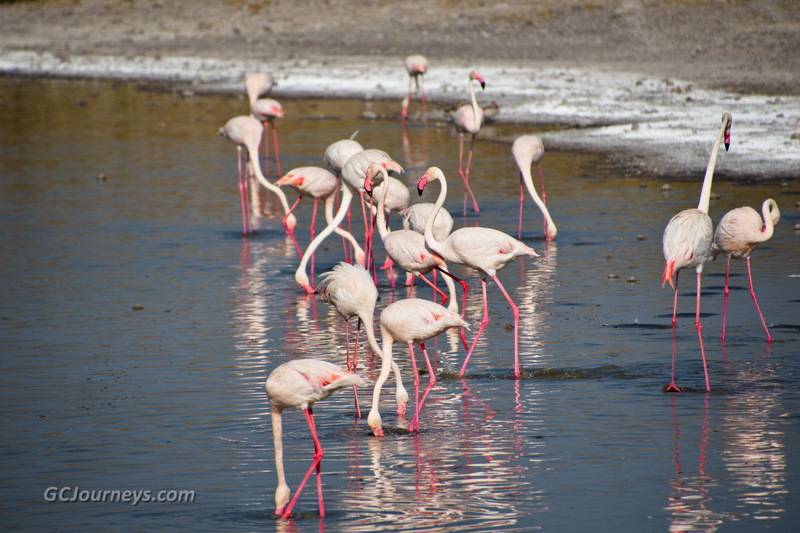 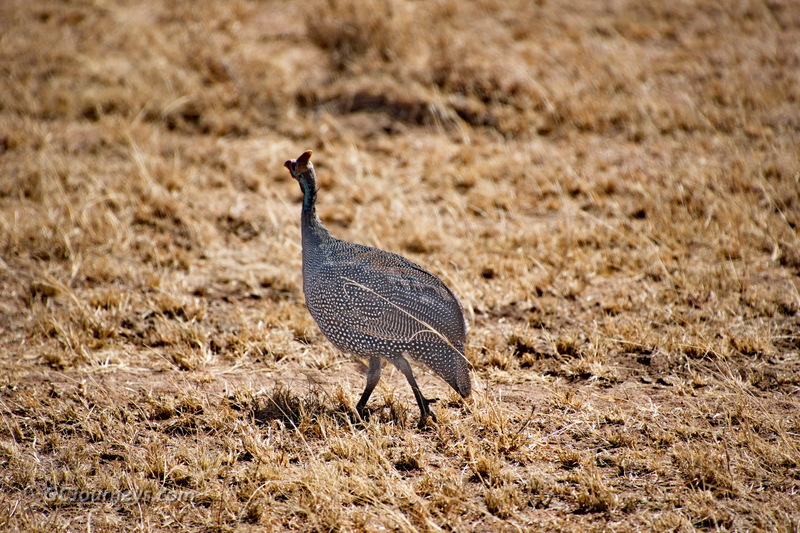 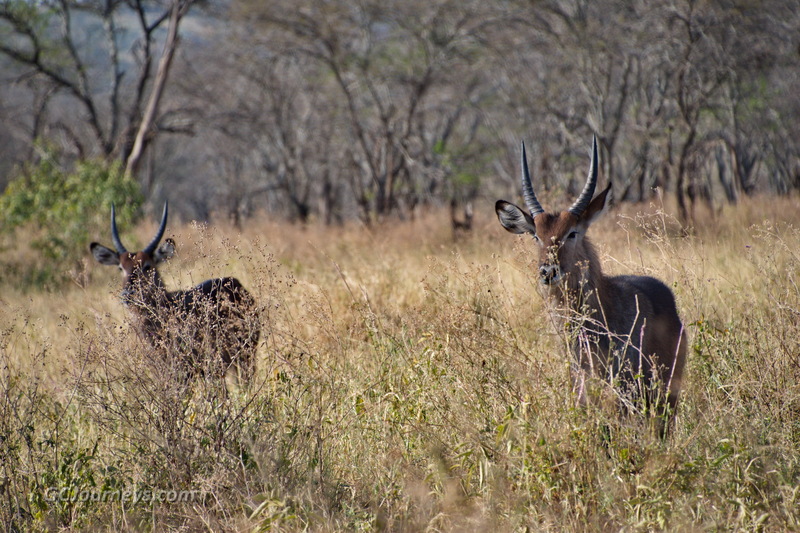 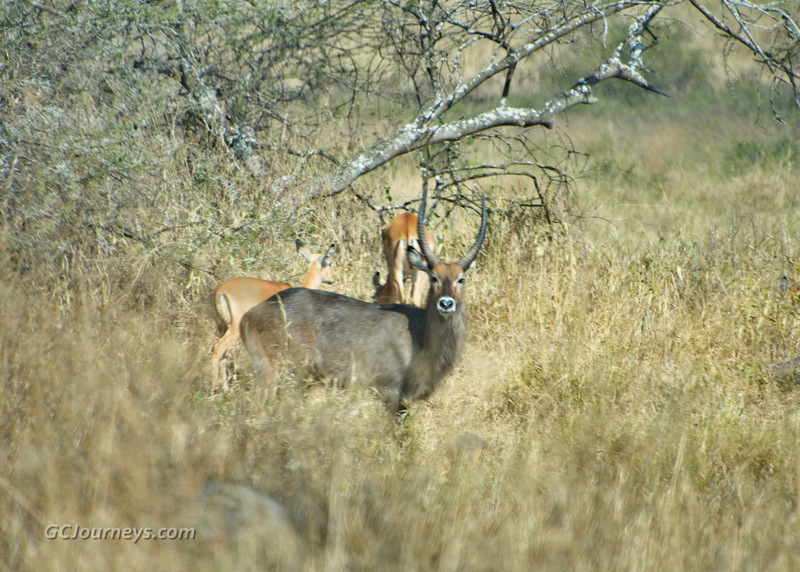 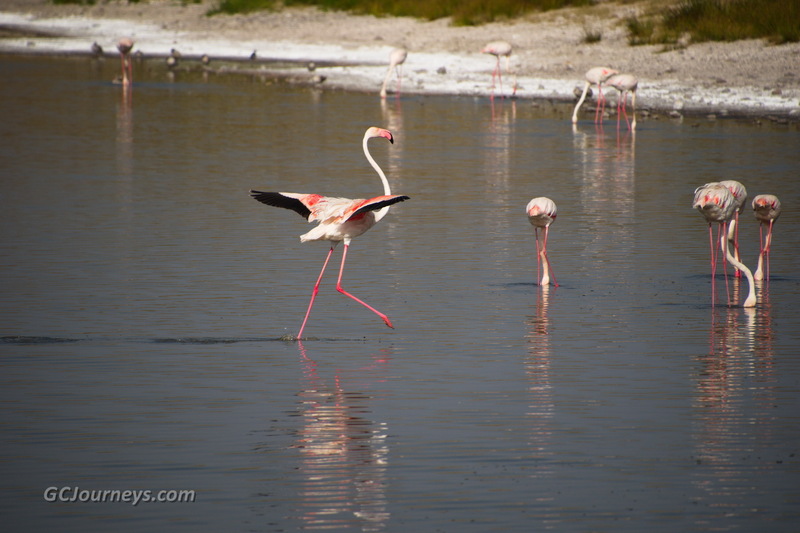 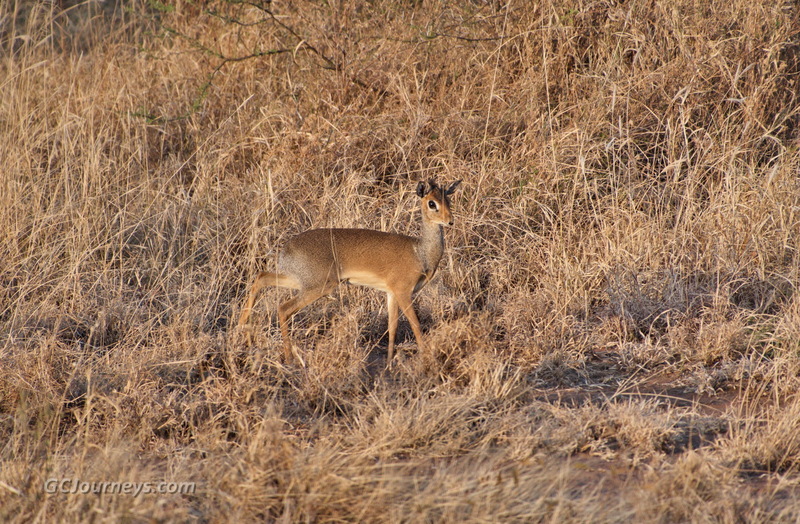 We also sighted Dik-dik’s, Jackals, Elephants, Hippos, Monkeys, a Baboon, Waterbucks, Gazelles, a Snake Eagle with young, a Blacksmith Plover, Yellow-billed Storks, Greater Flamingos, Zebras and Ostriches. 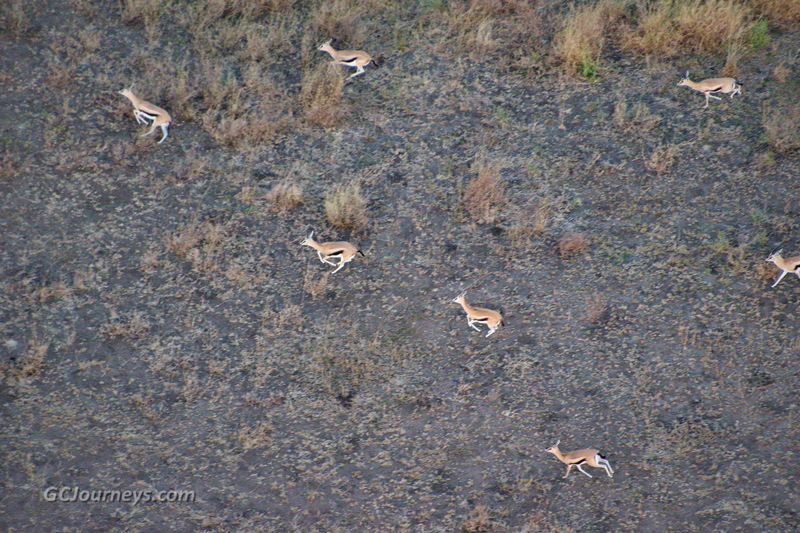 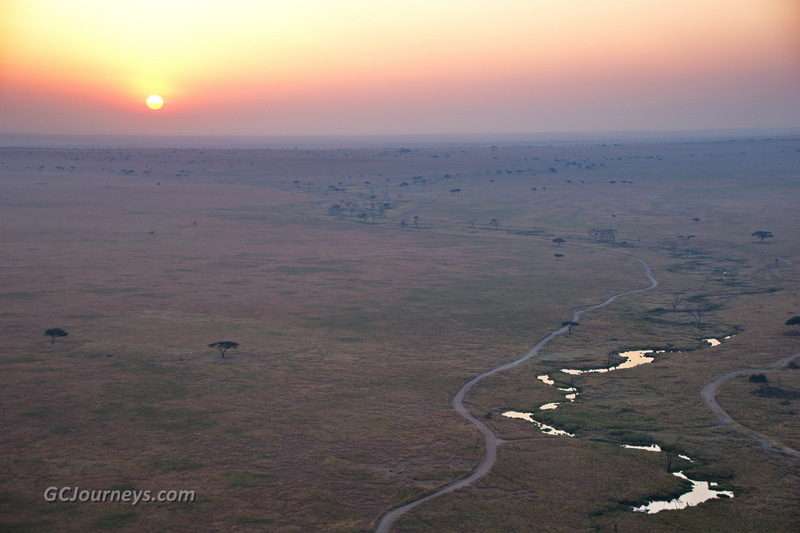 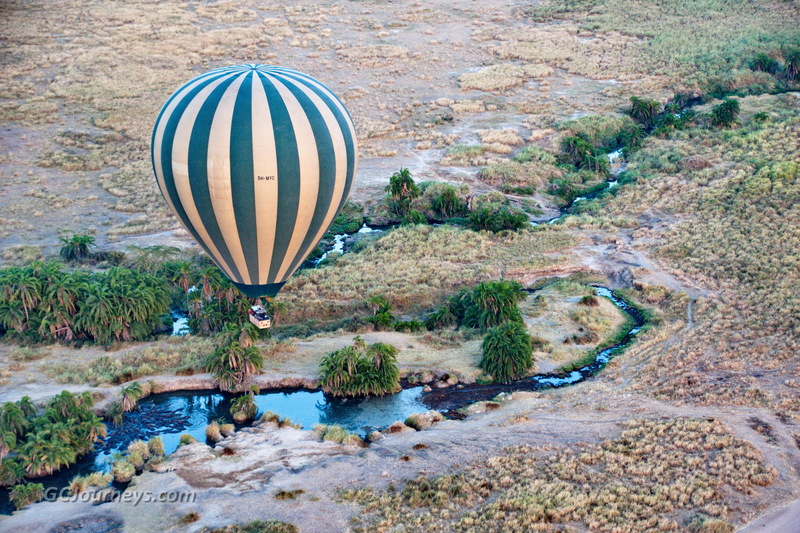 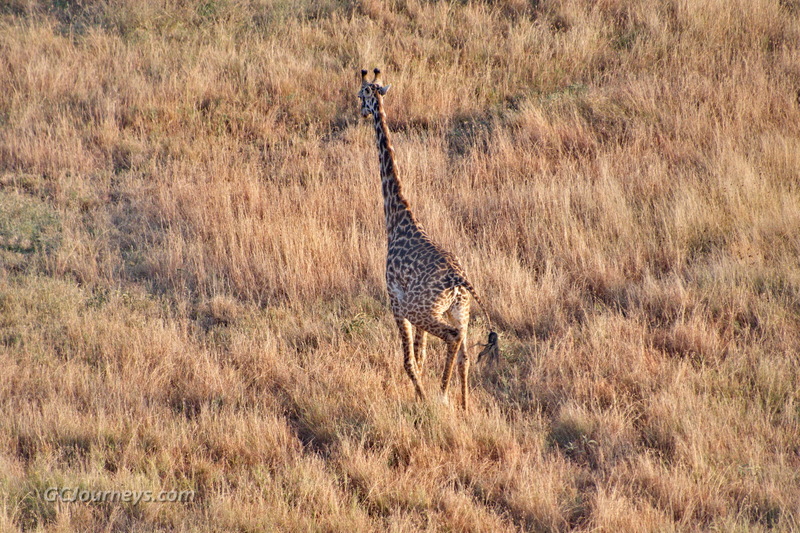 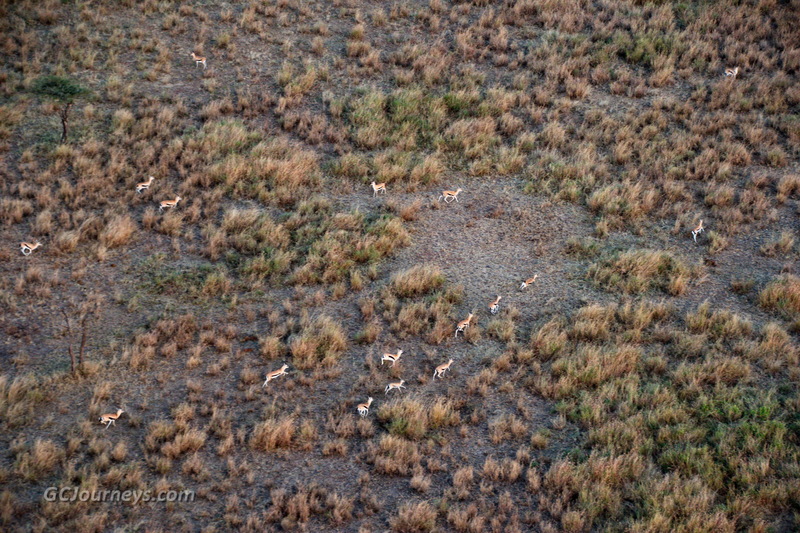 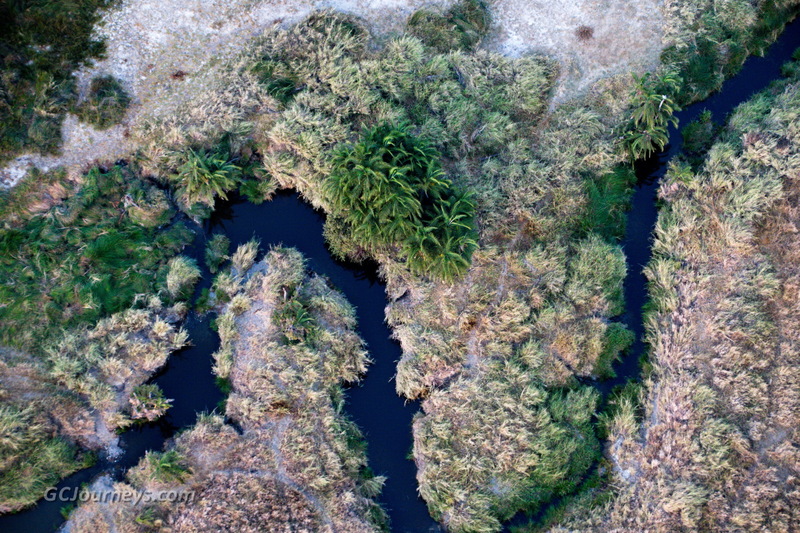 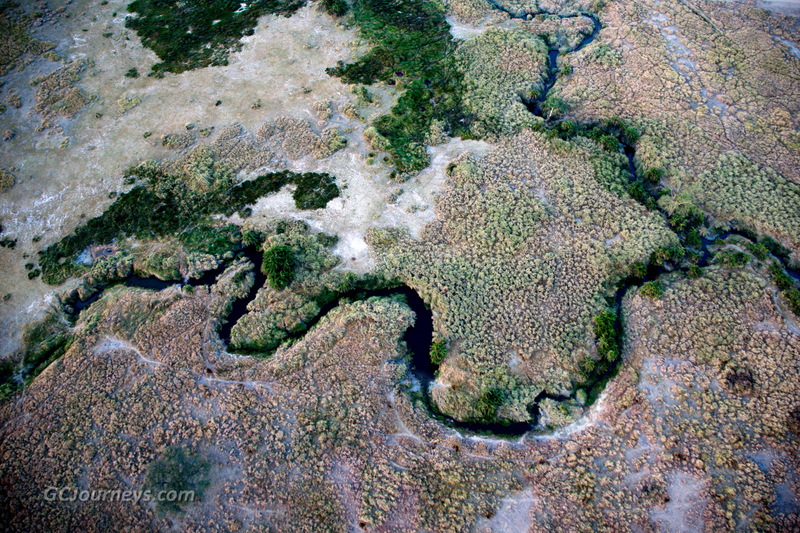 On the third day in the national park we did our long-anticipated dawn balloon ride over the Serengeti. 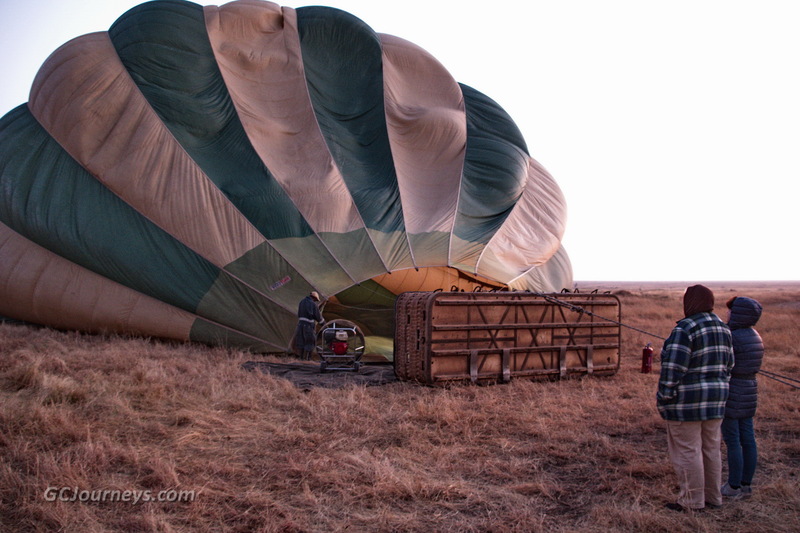 Up at 4:30 for the long drive to the launch site, where we found that our balloon was one of four flying that day, each with 16 passengers plus pilot. 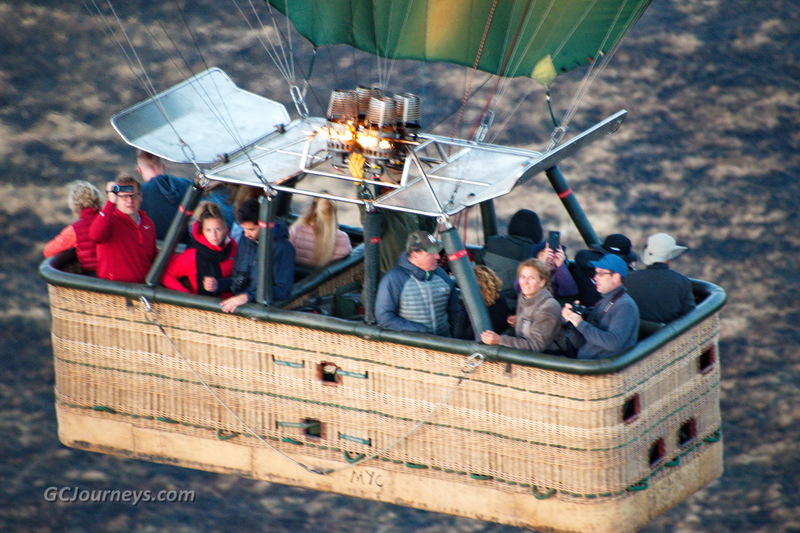 Take-off was interesting, with the basket on its side and all of us laying on our backs like astronauts in a space shuttle launch. 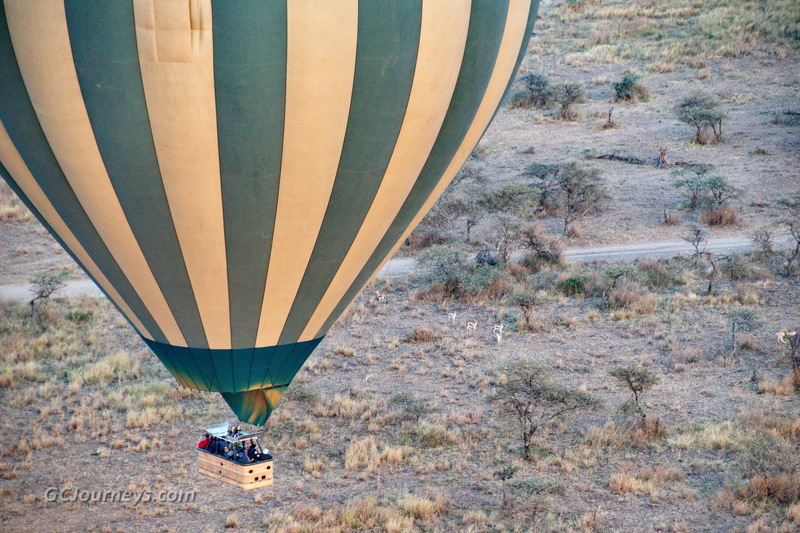 The ride was all we hoped for and more. 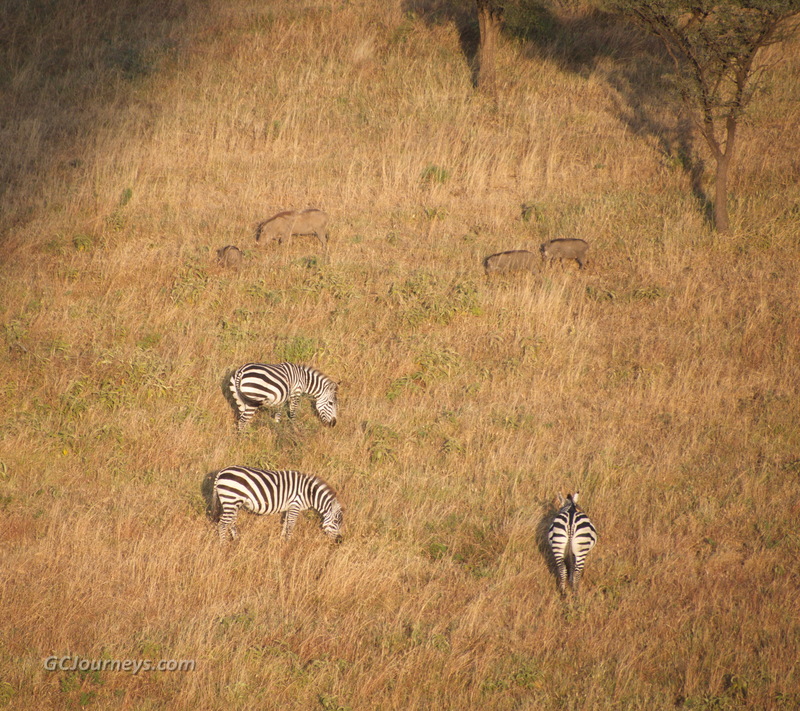 Watching the sun rise and seeing many animals from heights ranging from about 10 feet to 800 feet was an unforgettable experience. 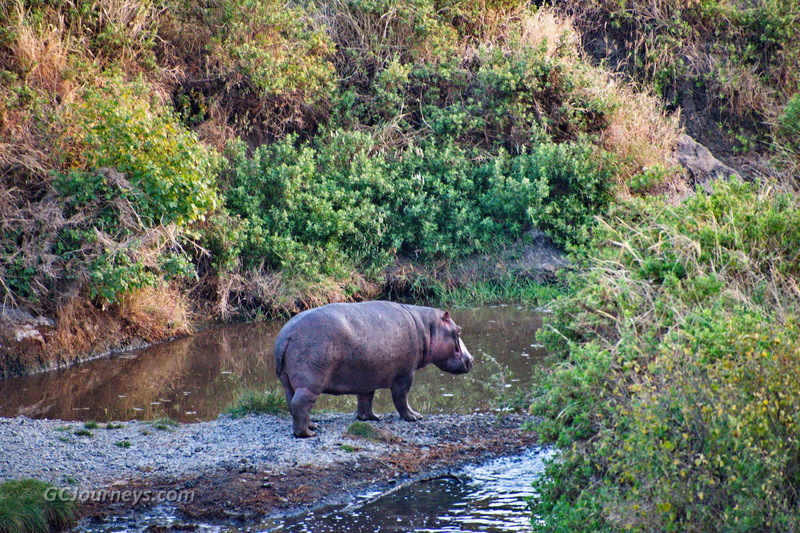 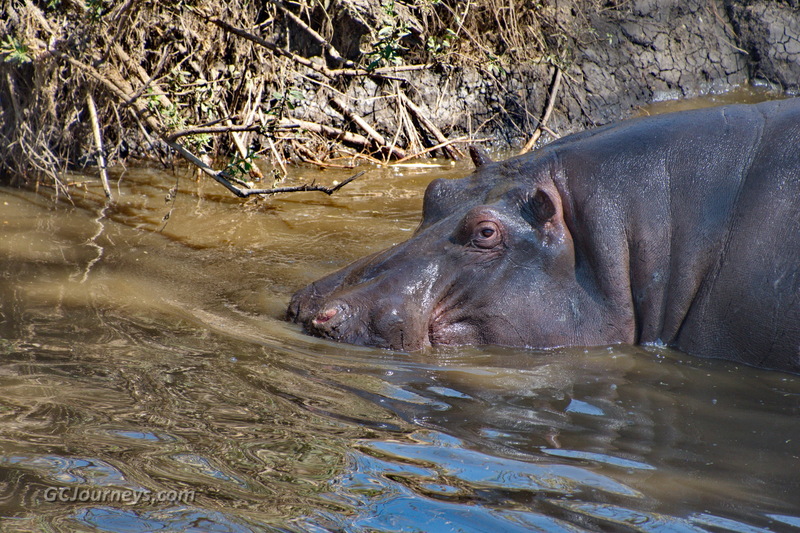 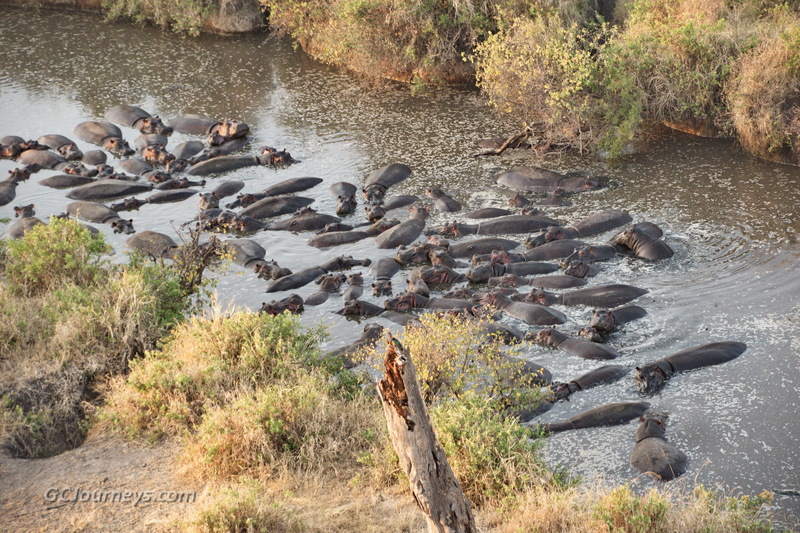 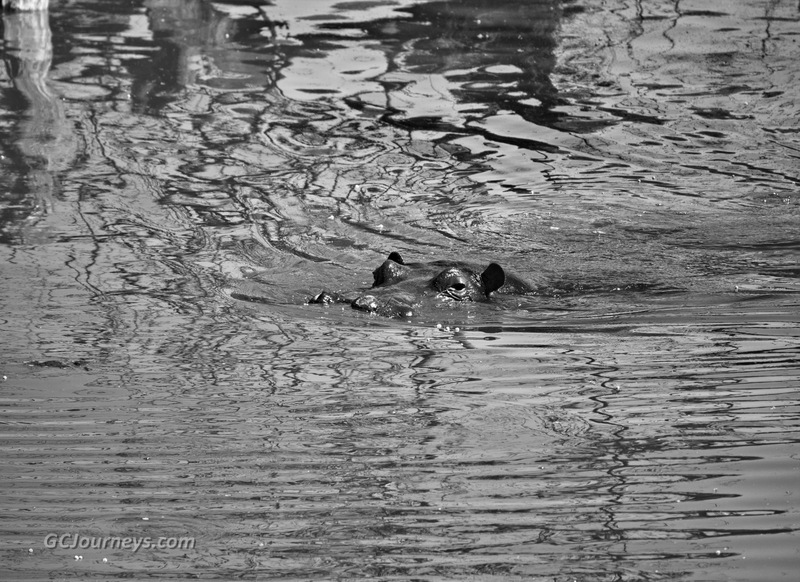 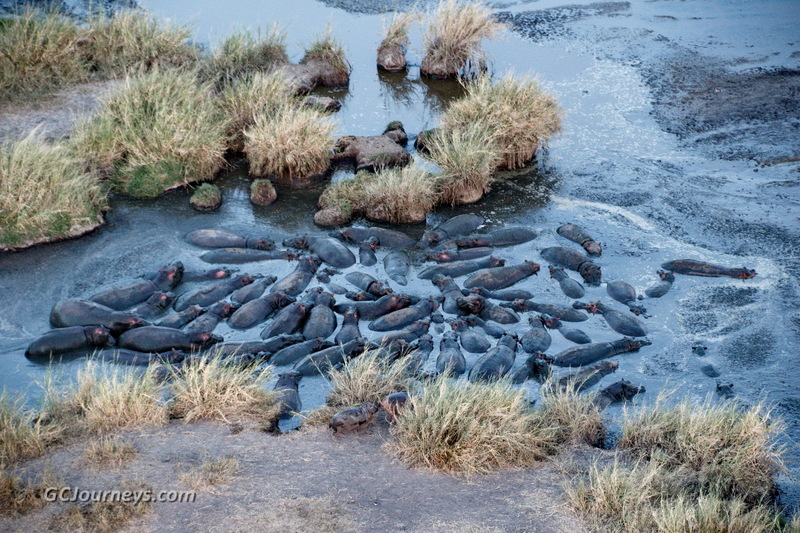 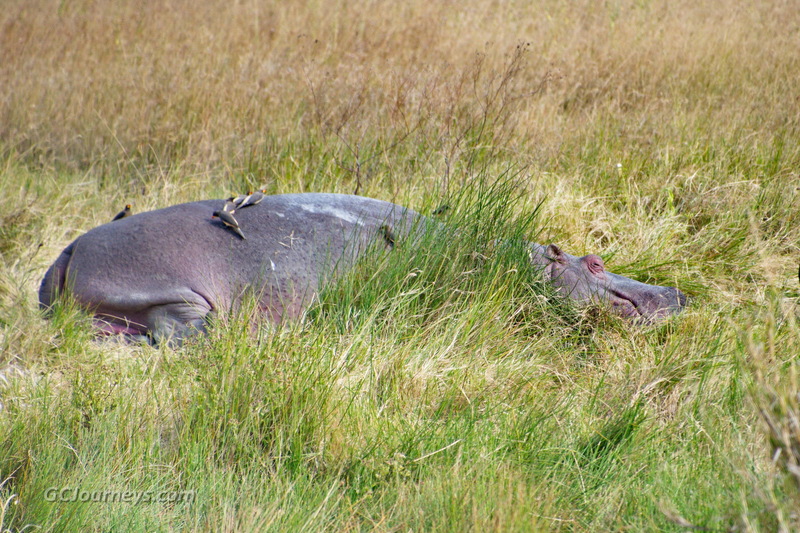 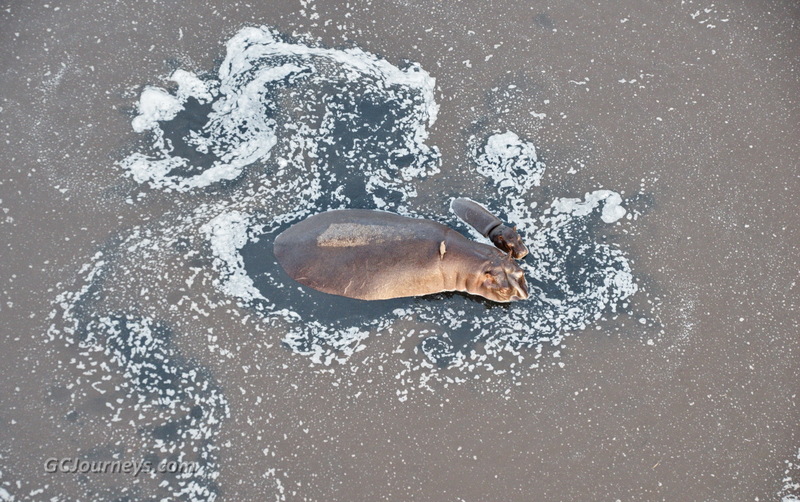 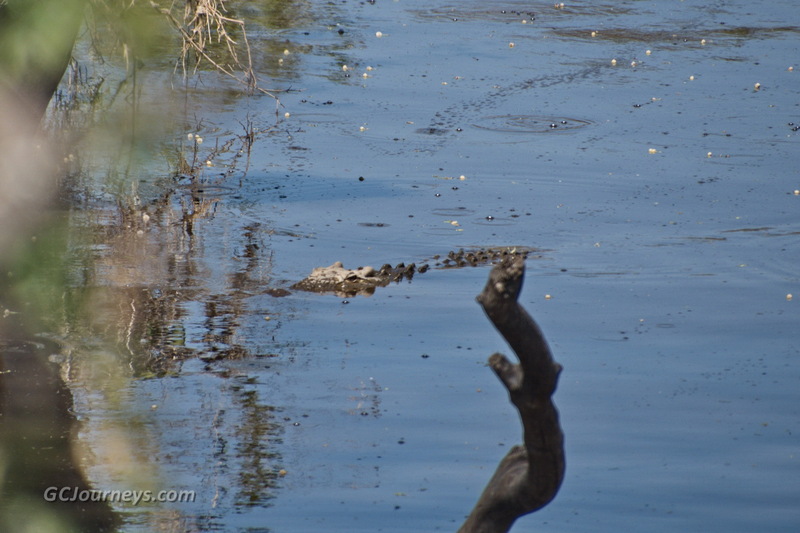 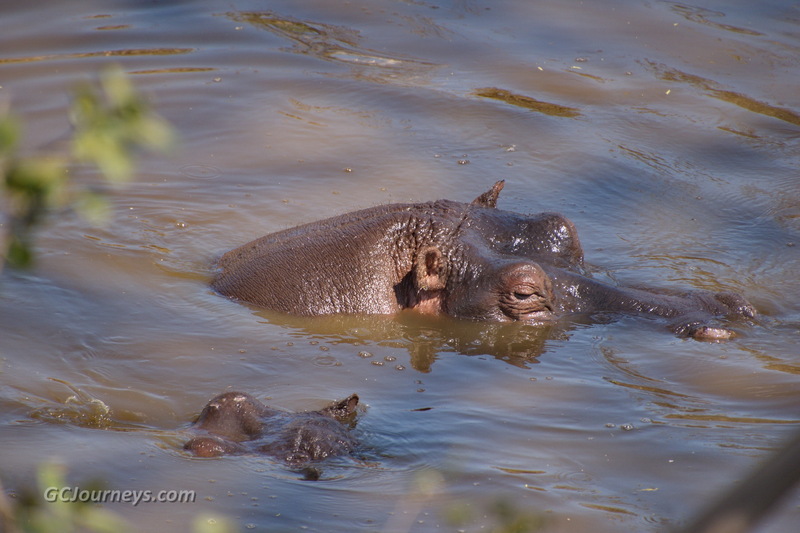 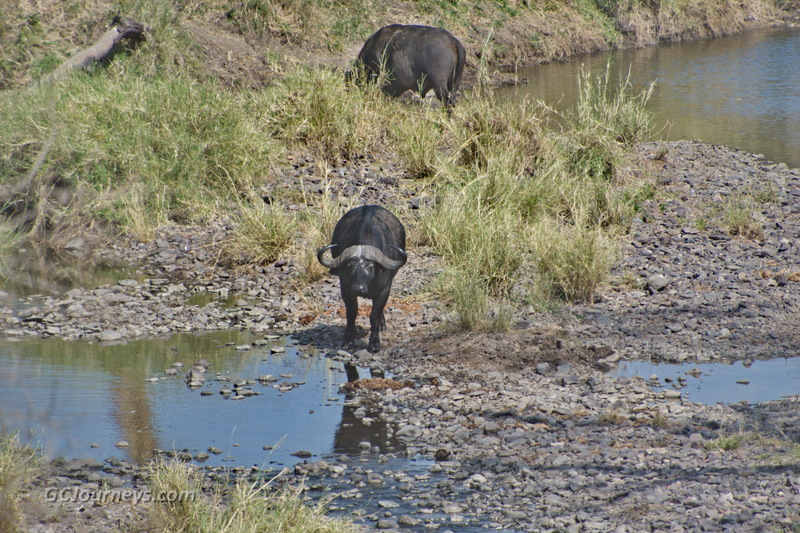 We saw literally hundreds of hippos, crowded in large groups of up to 70 at a time. 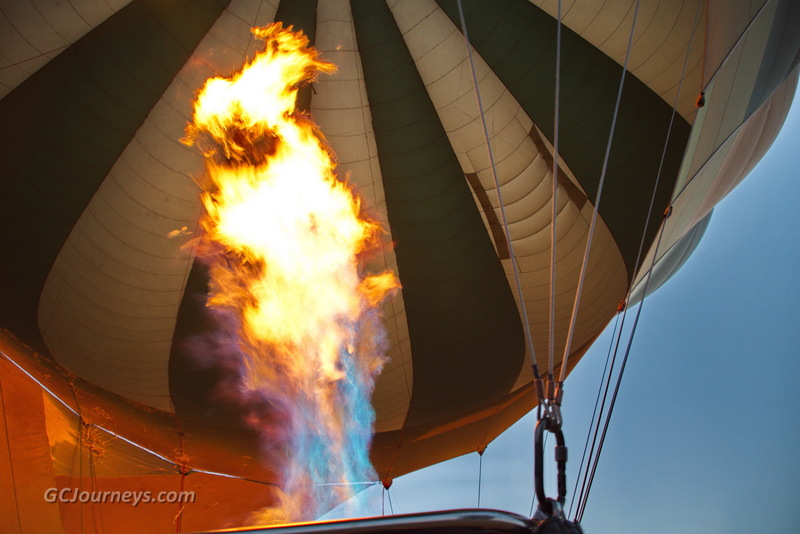 Most of the animals were unaffected by the sight of the balloon, but scattered whenever the pilot fired the burners to provide more lift. 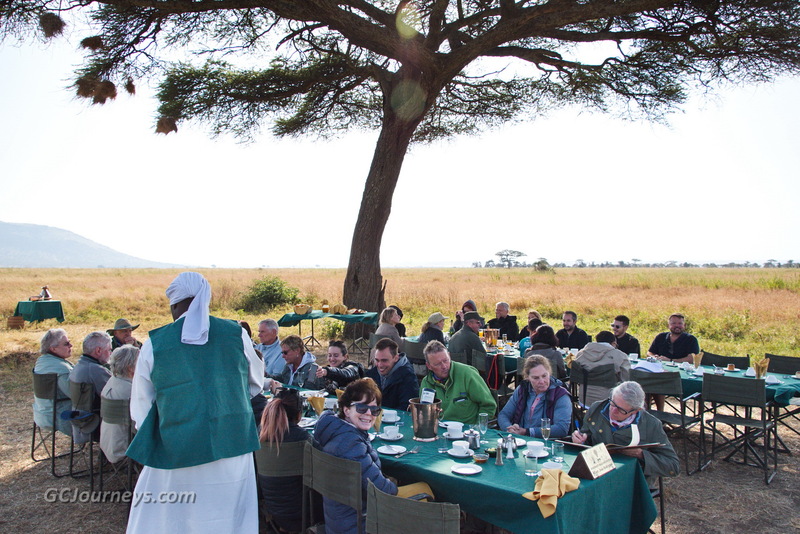 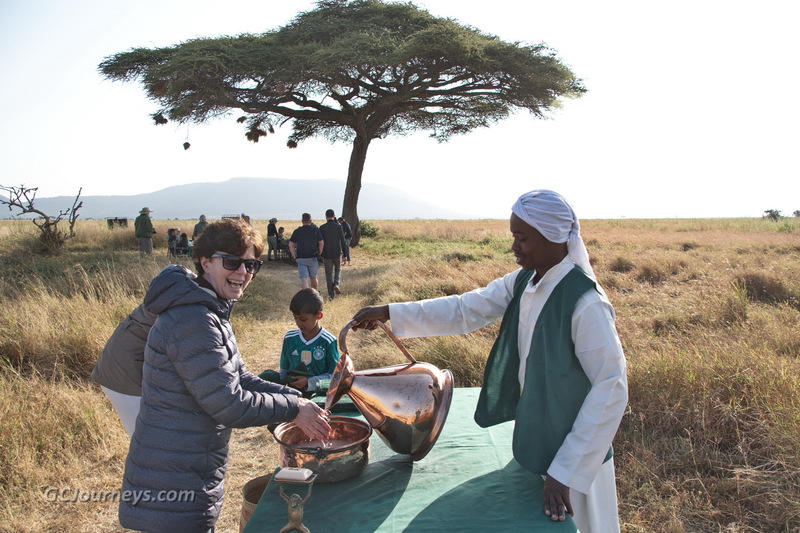 At the end of the ride we were treated to champagne or juice followed by a full “English” breakfast under a giant acacia tree. 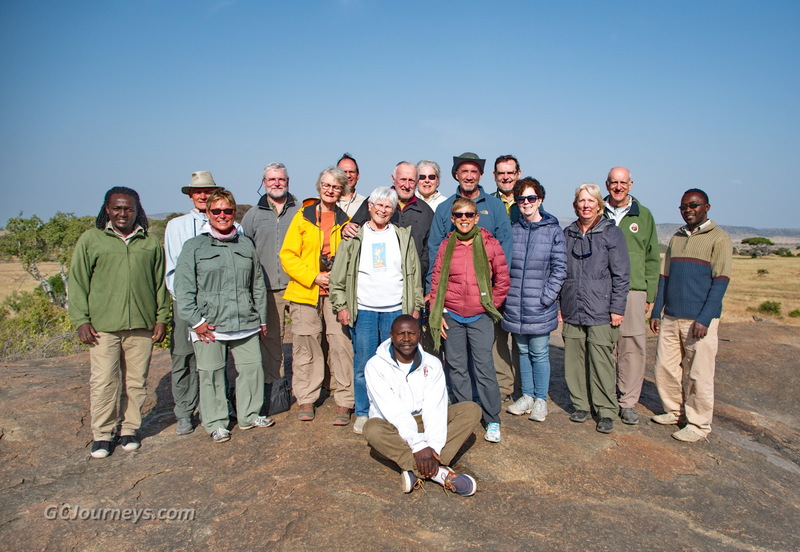 On our way back to camp after the balloon adventure we watched for more game and stopped at a visitor center for a guided interpretive tour. 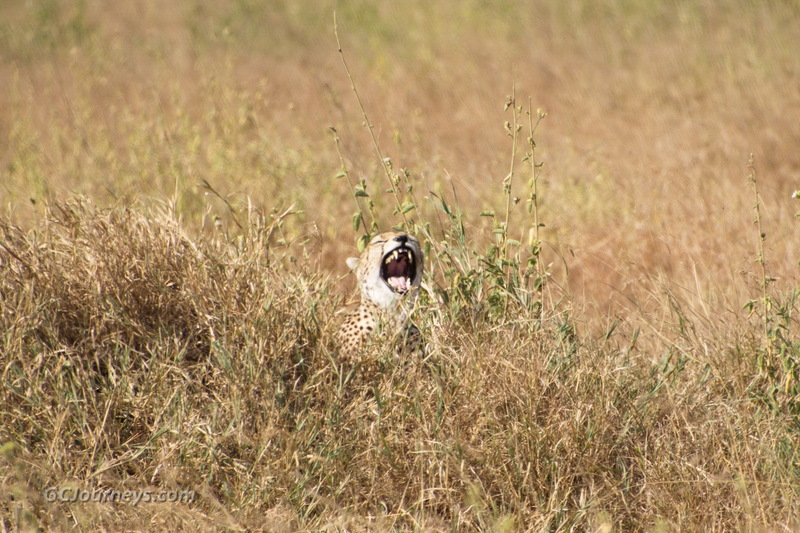 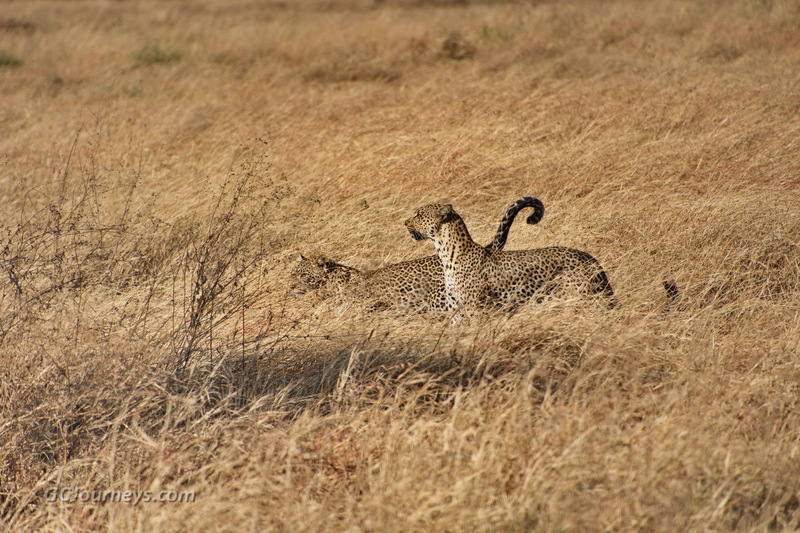 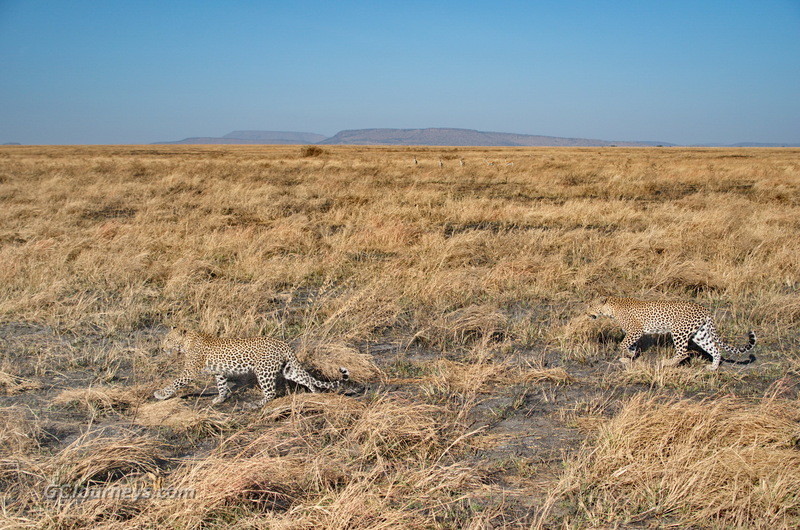 After lunch at the camp we enjoyed yet another game ride, during which we saw our first cheetahs. 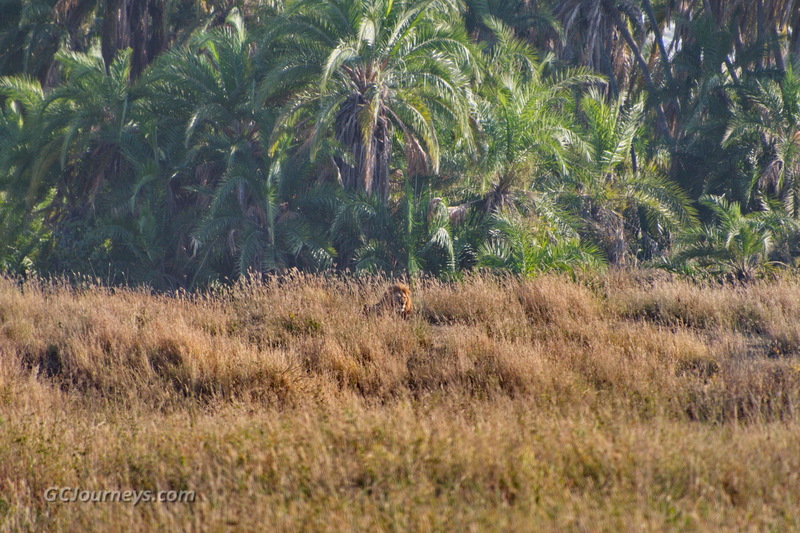 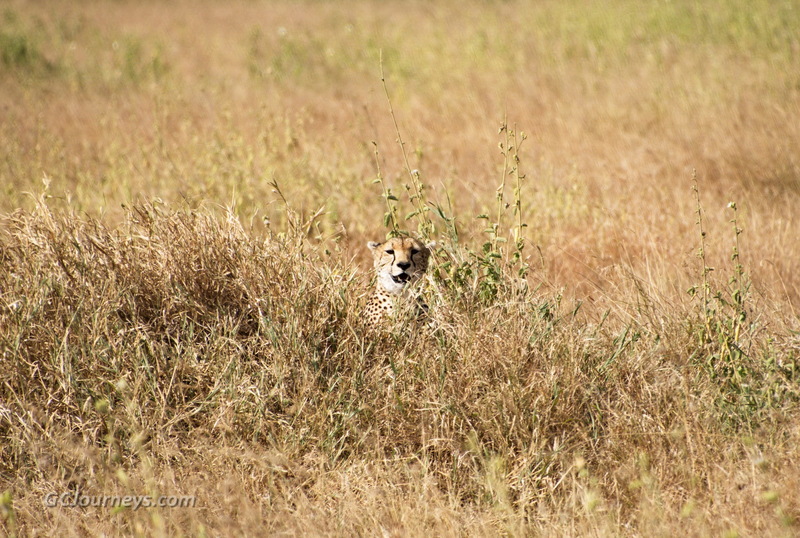 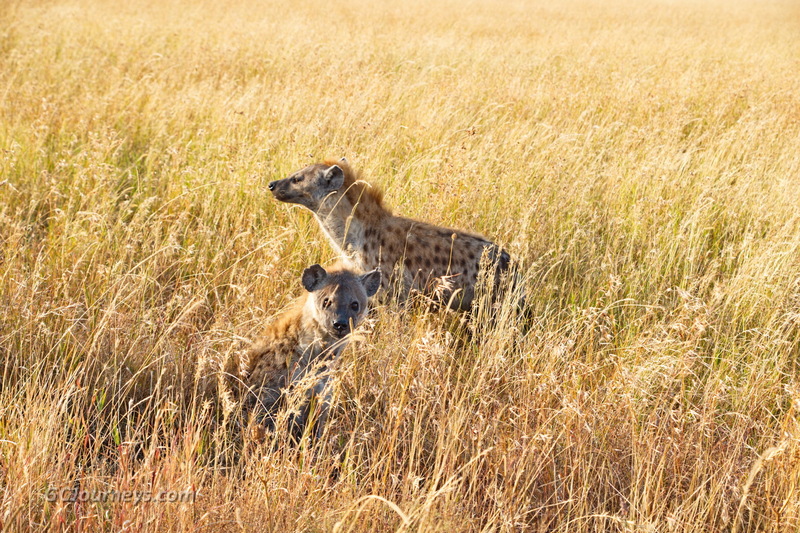 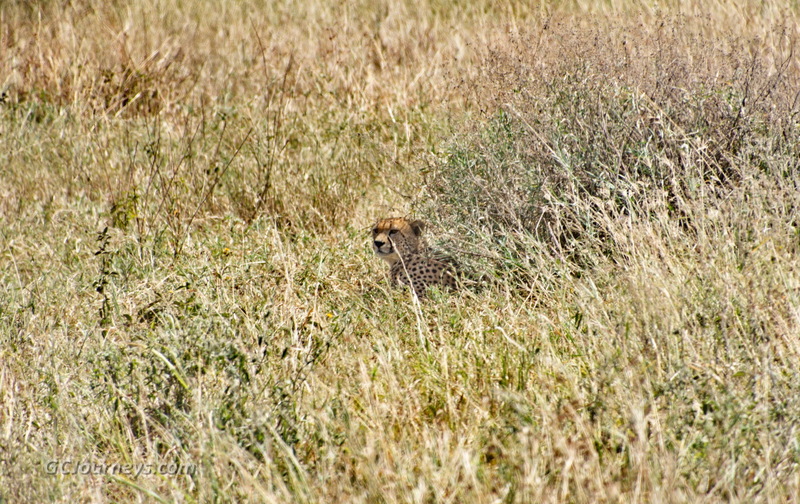 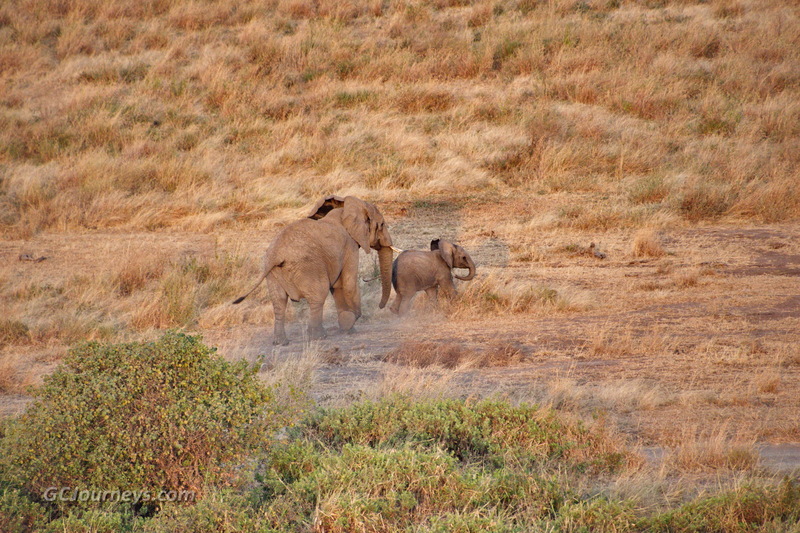 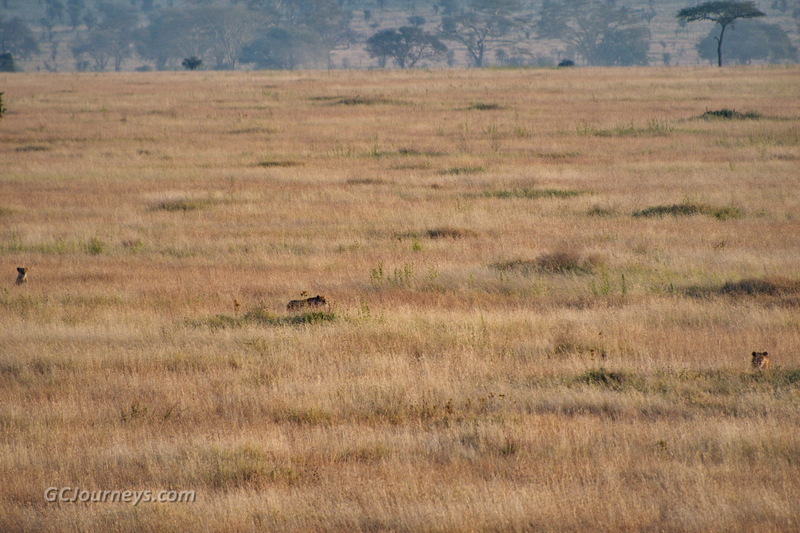 First we sighted an adult stalking through the grass, and then a cub hidden under a bush until it poked its head out. 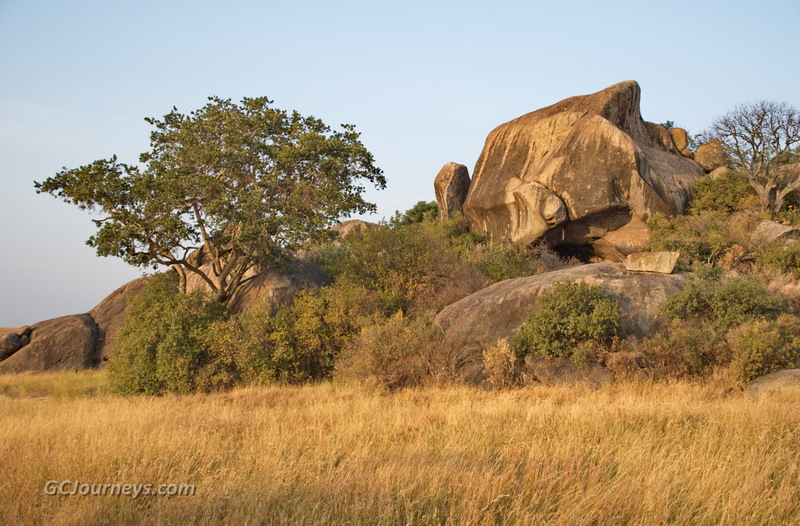 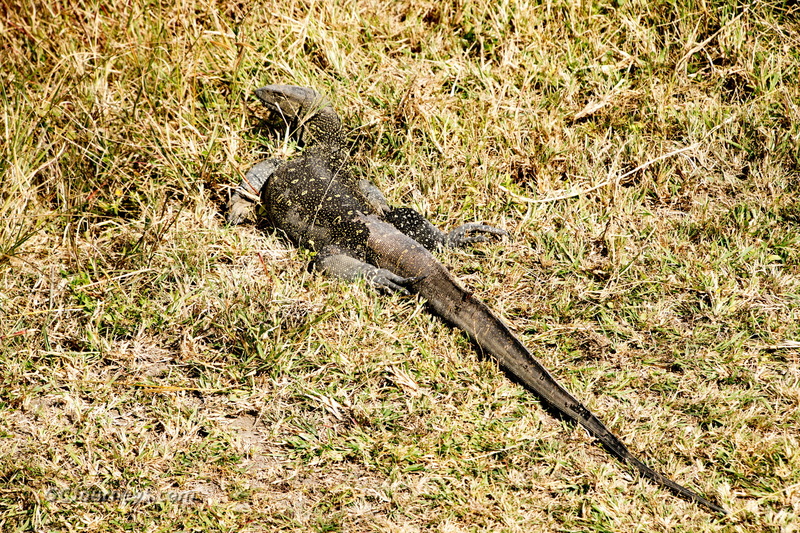 Other sightings of the day included elephants, lions, hundreds of gazelles, giraffes, rock hyrax, topi, buffalo, a giant monitor lizard, and a brightly colored agama lizard. 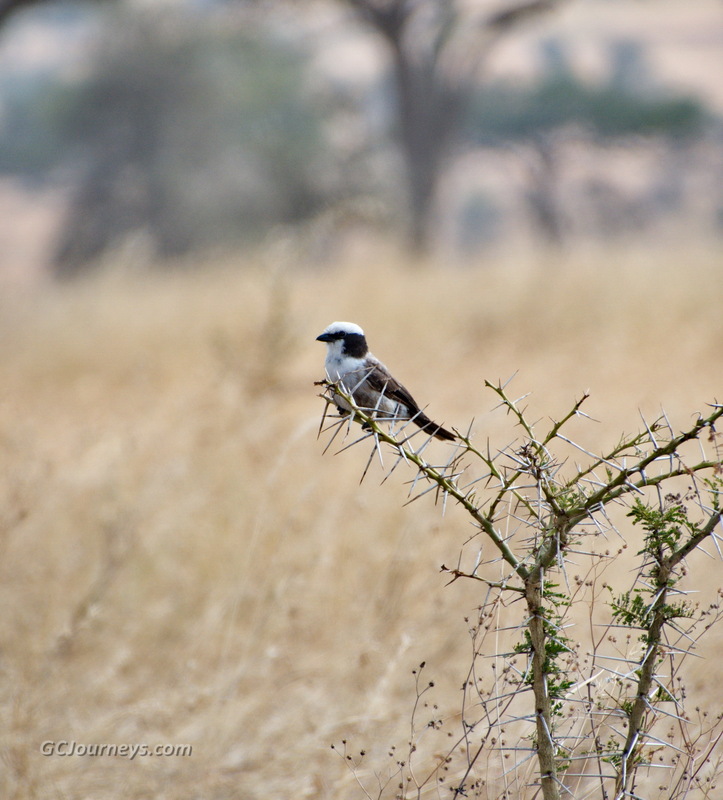 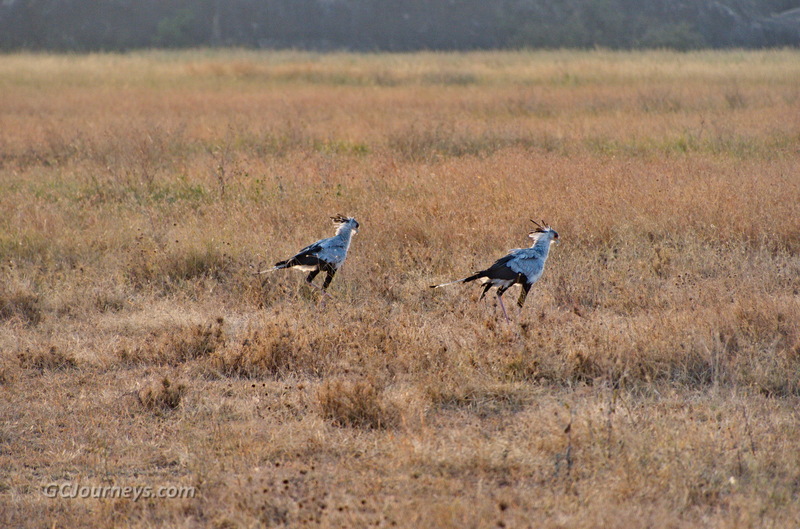 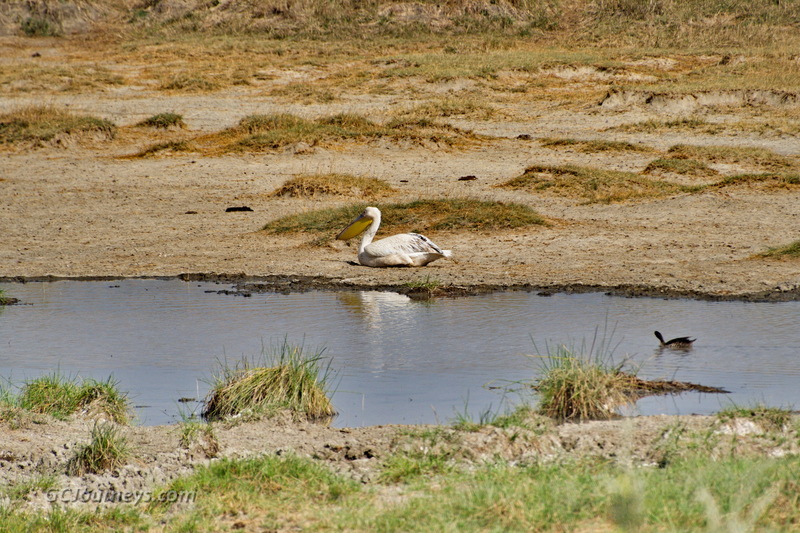 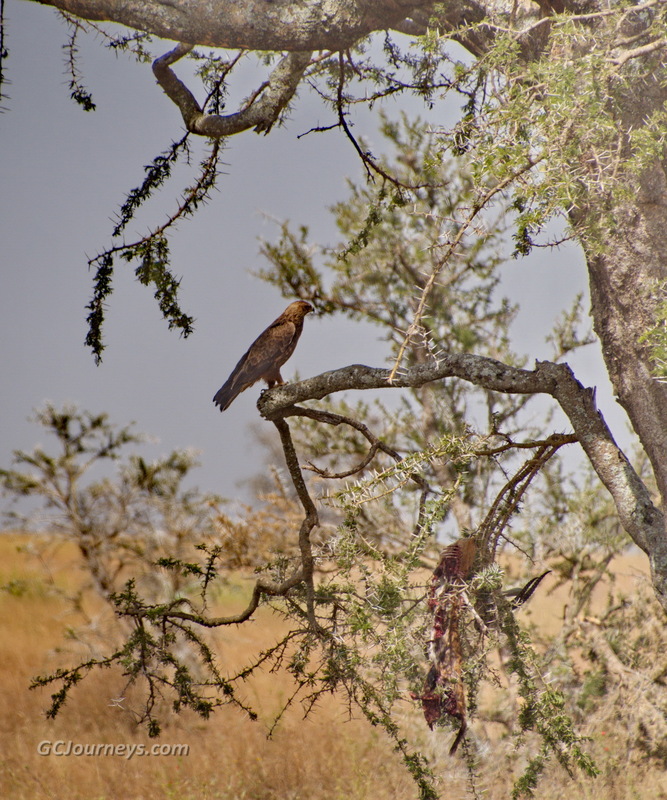 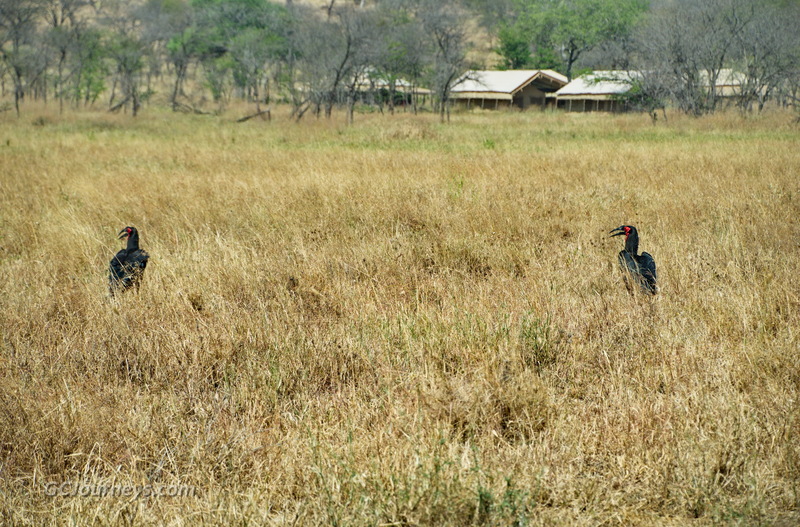 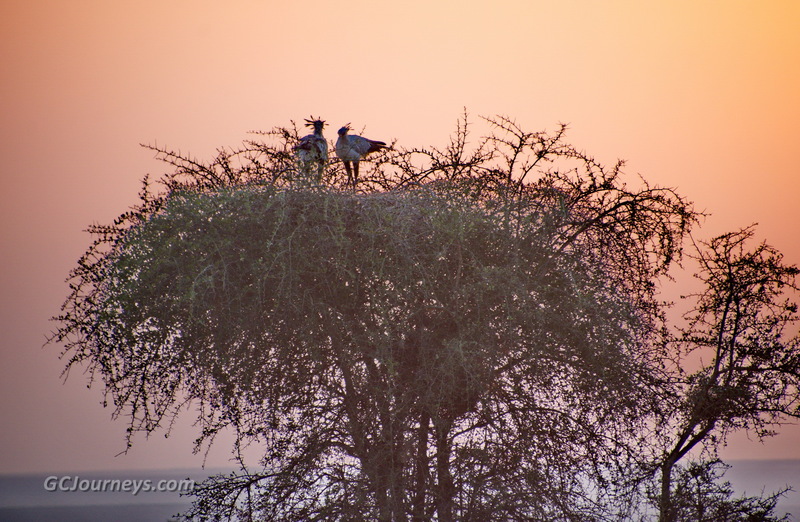 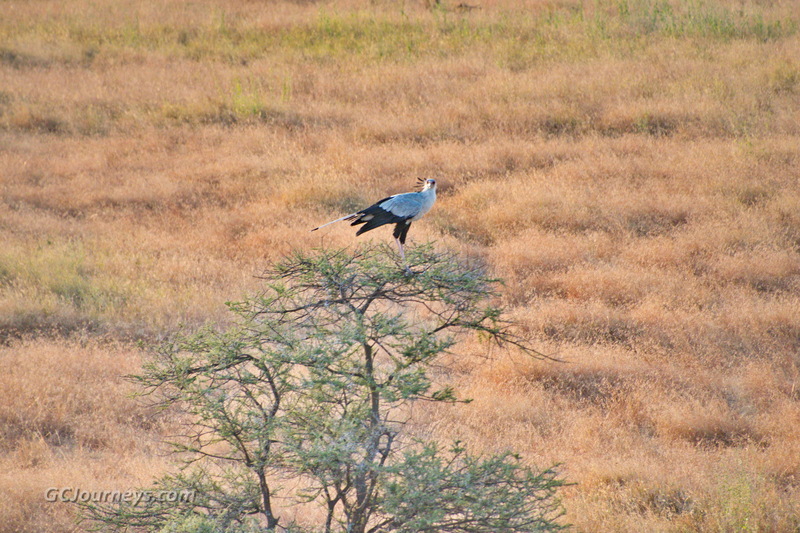 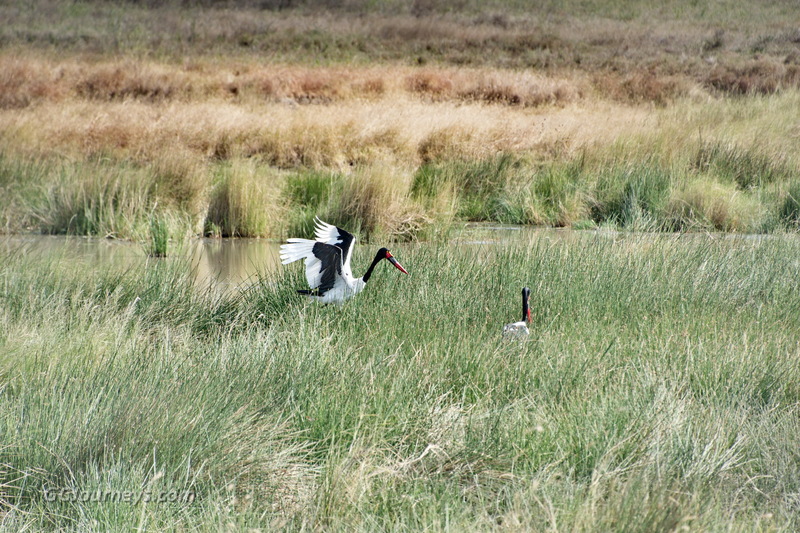 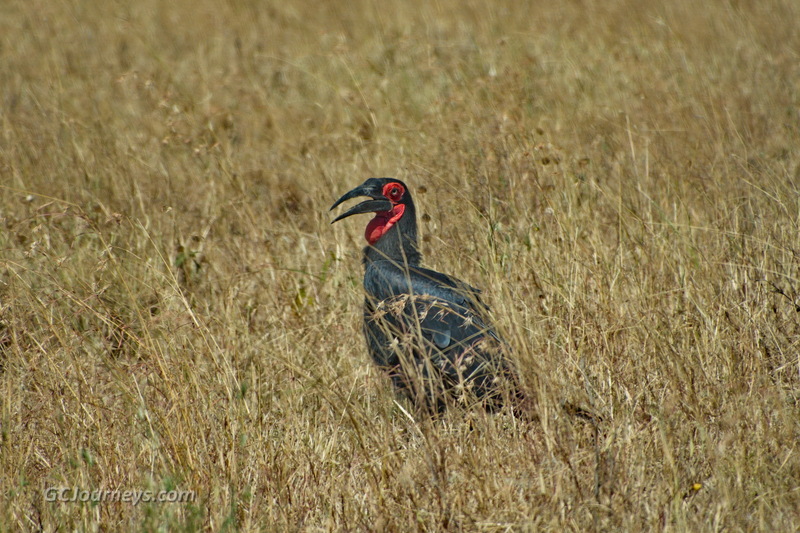 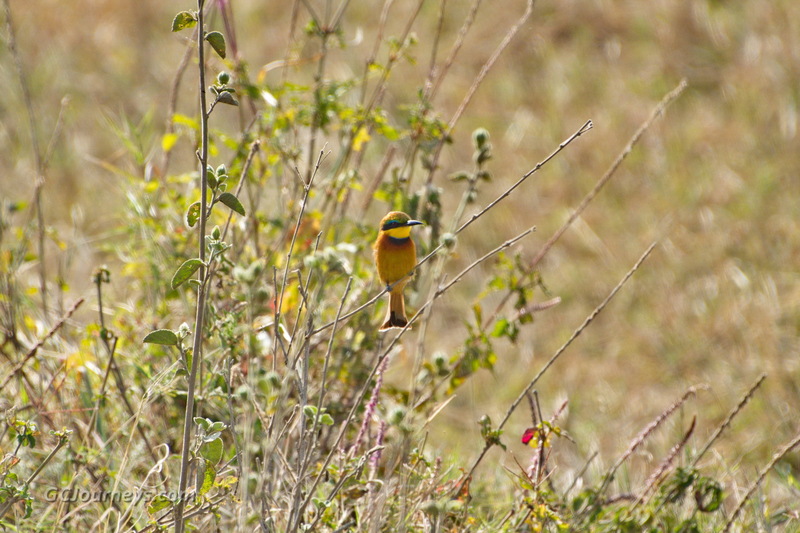 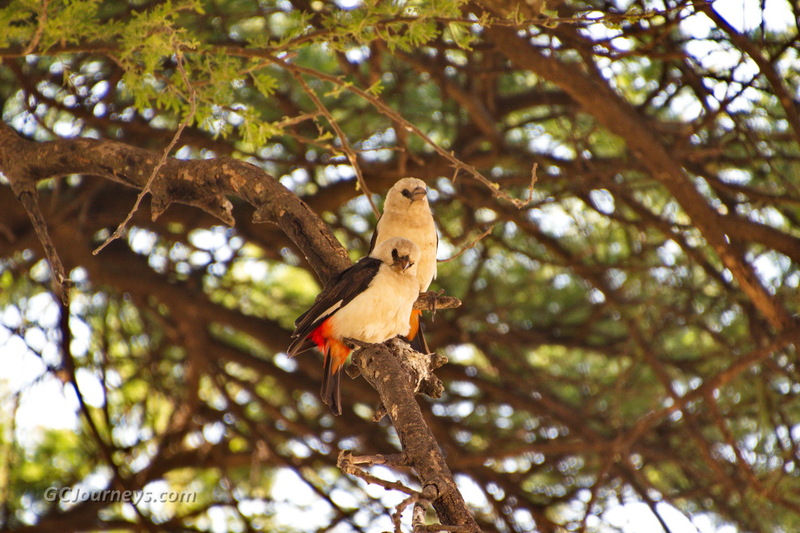 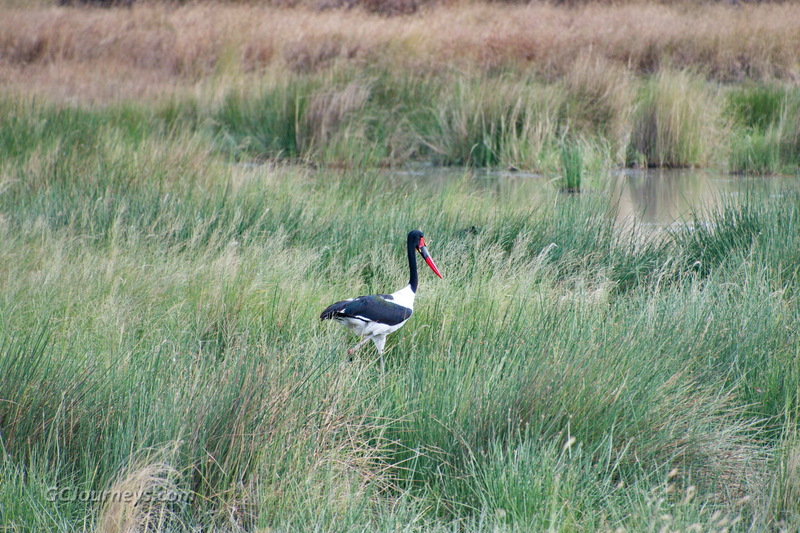 Birds included a secretary birds, guinea fowl, white-backed vultures, white-crowned shrike, saddle-billed storks, a great white pelican, and a little bee-eater. 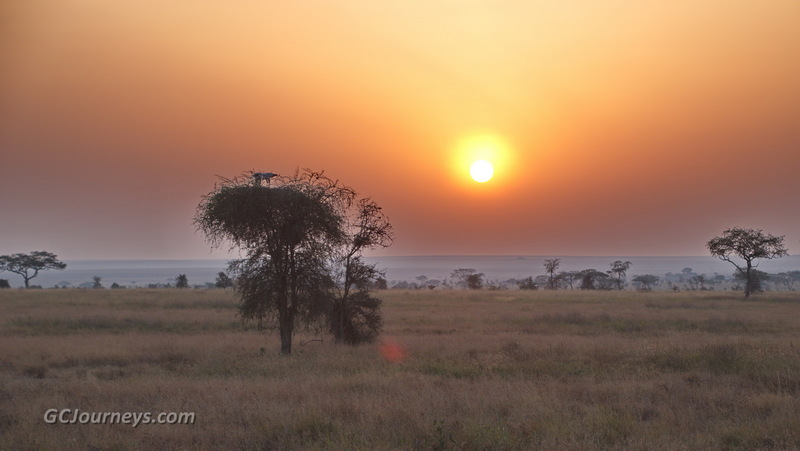 On the fourth and final full day here we left at dawn for an early morning game ride to the southern area of the Serengeti National Park in an unsuccessful search for rhinoceros. 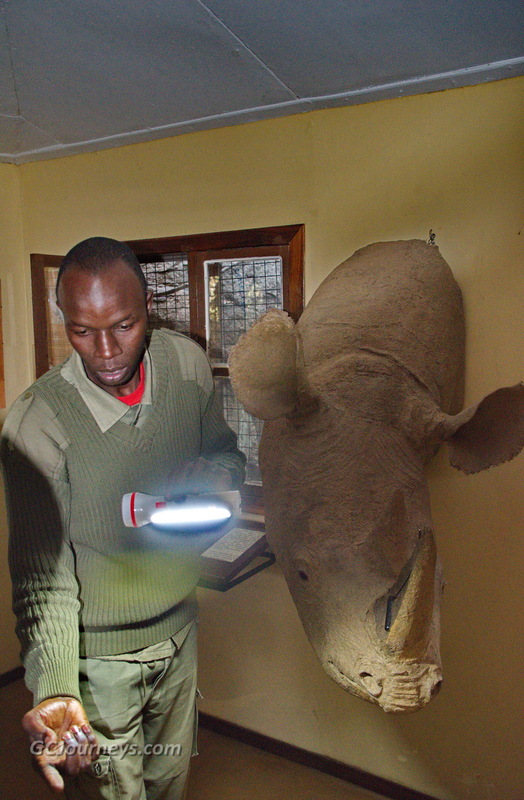 We stopped at the rhino protection ranger station and learned all about them from one of the rangers. 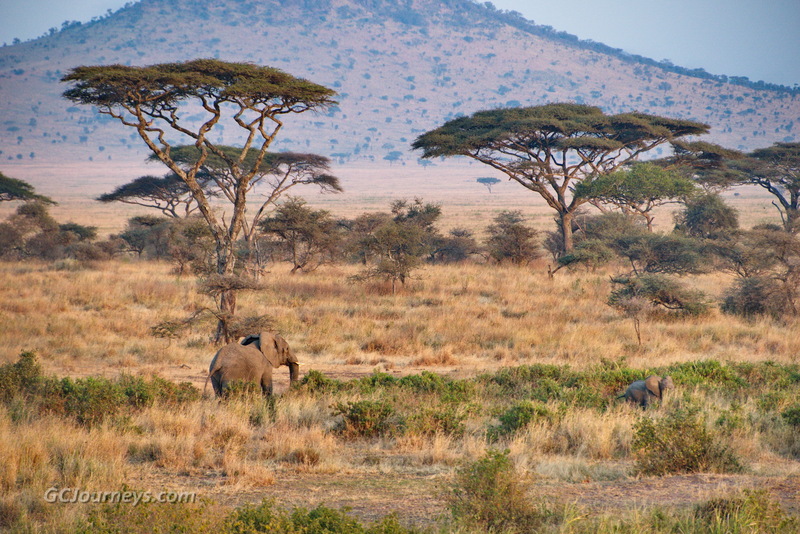 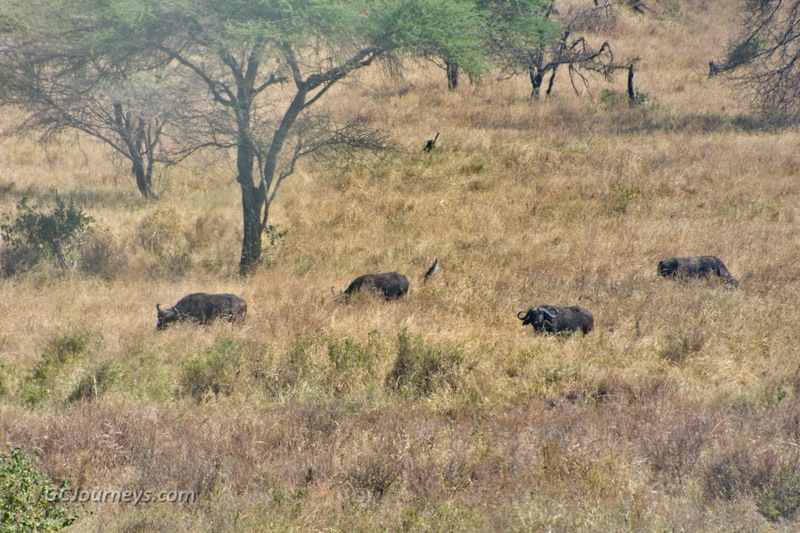 They try to keep all the Serengeti rhinos in this small area so they can keep watch and protect them from poachers. 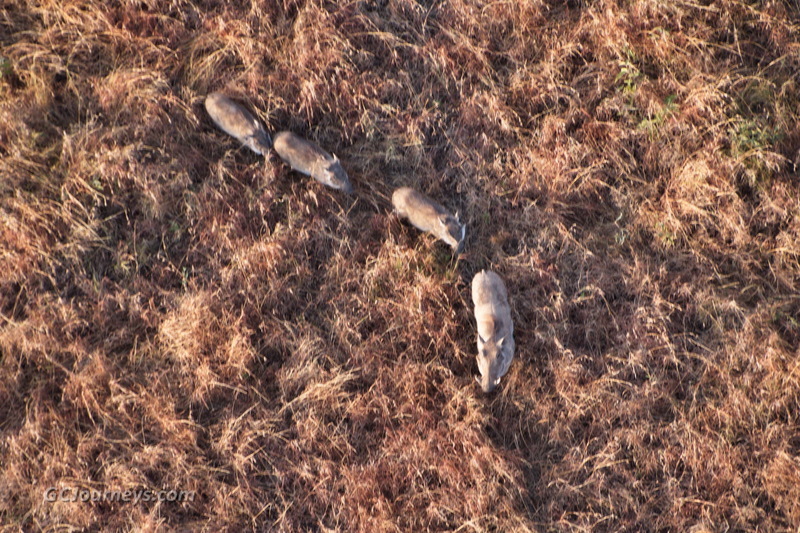 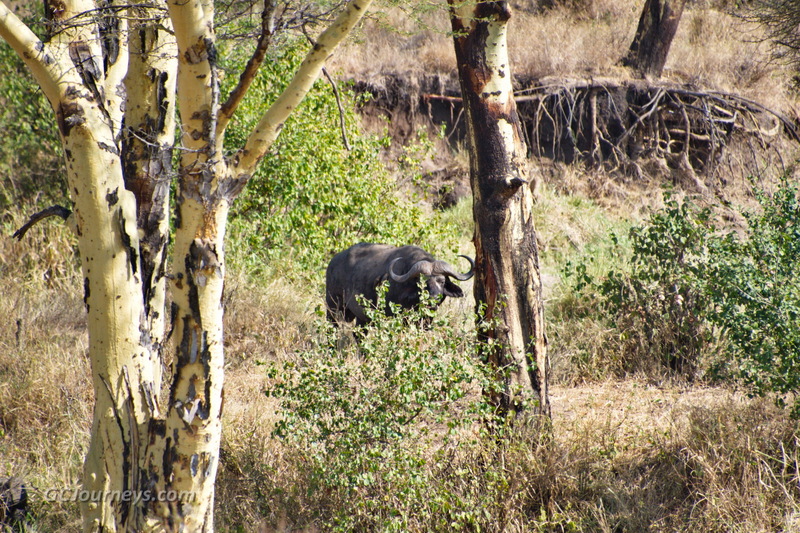 All have tracking devices embedded in their horns, but the rangers won’t tell the guides where the rhinos are located to keep them from being spooked by safari vehicles. 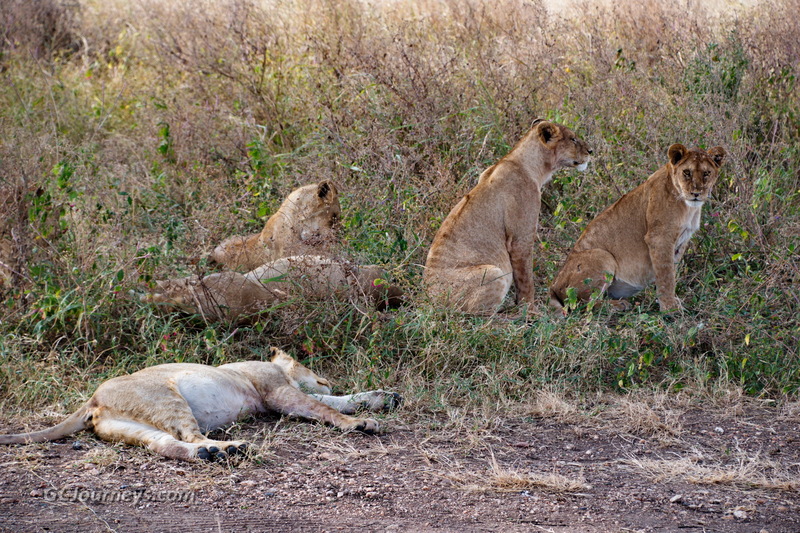 Today’s highlight was a group of 10 sleepy lions, some of which suddenly sat bolt upright when our guide started imitating a zebra. 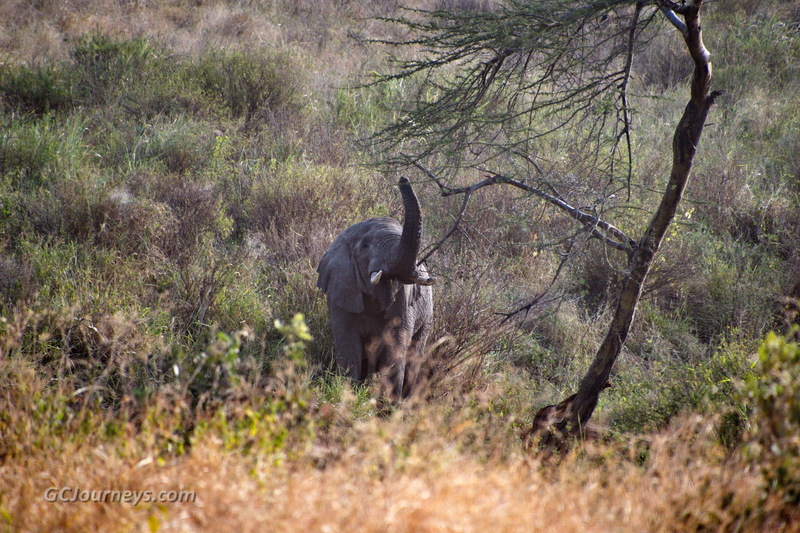 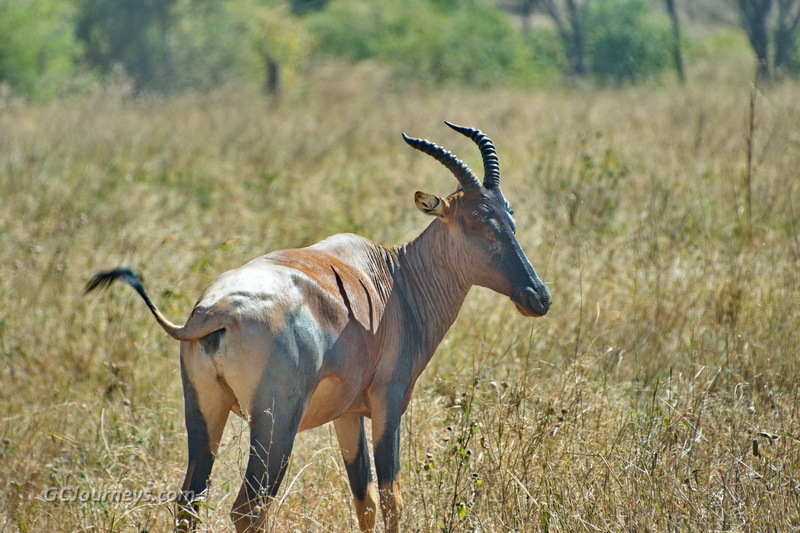 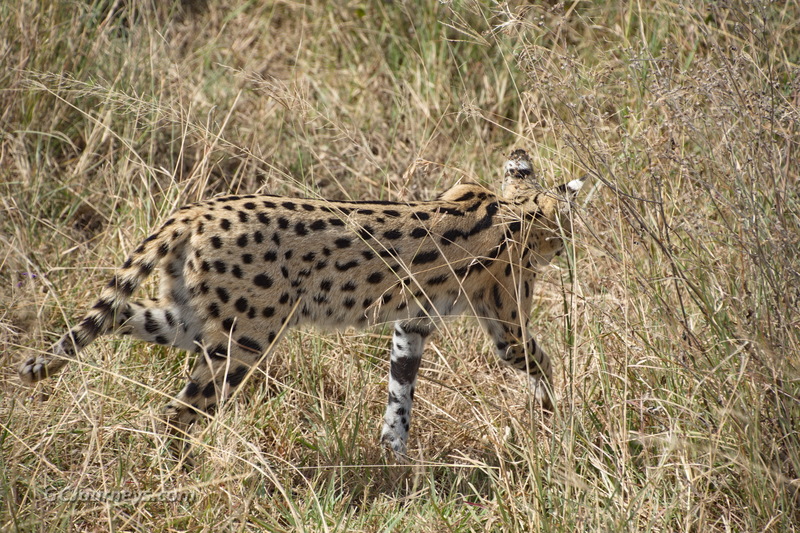 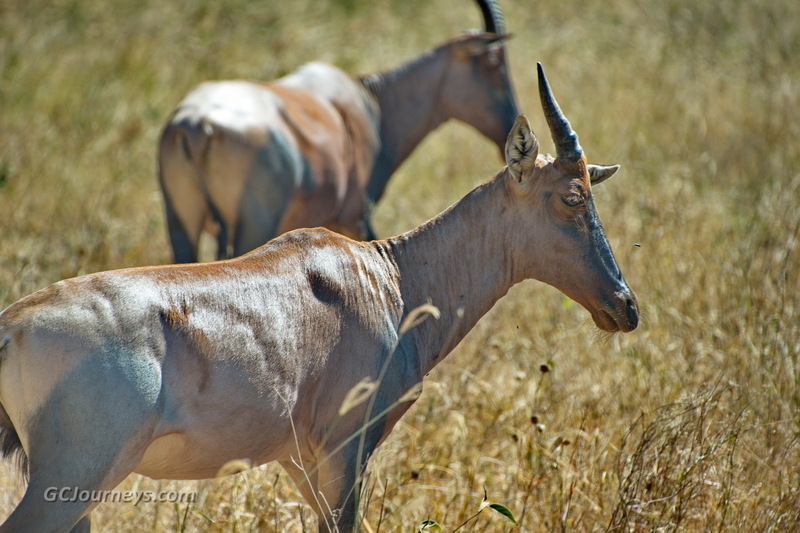 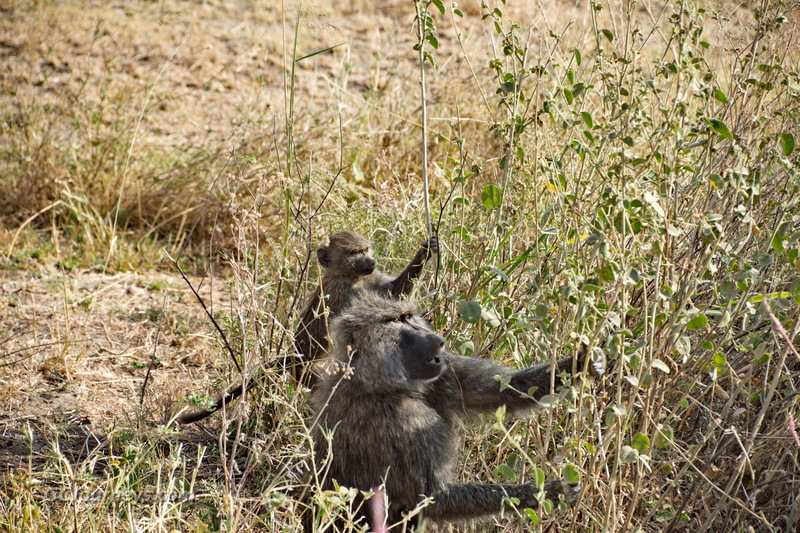 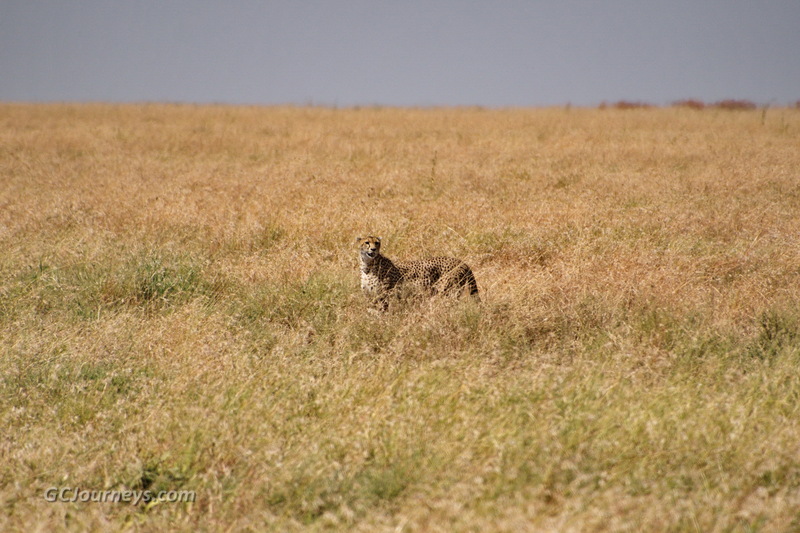 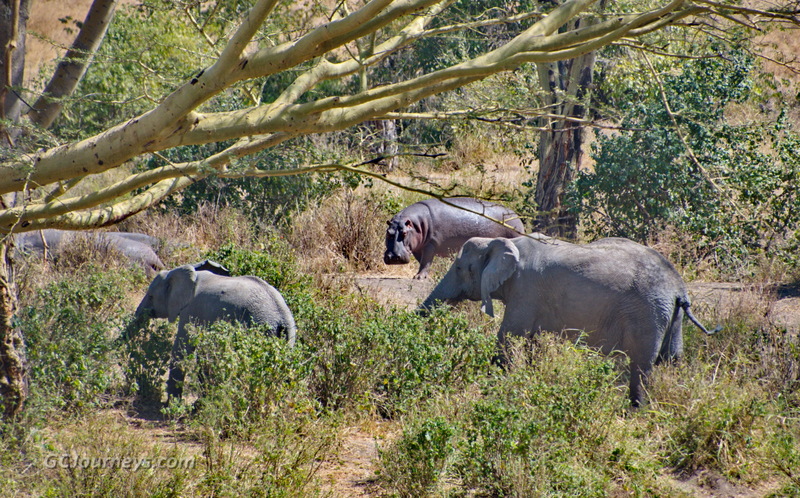 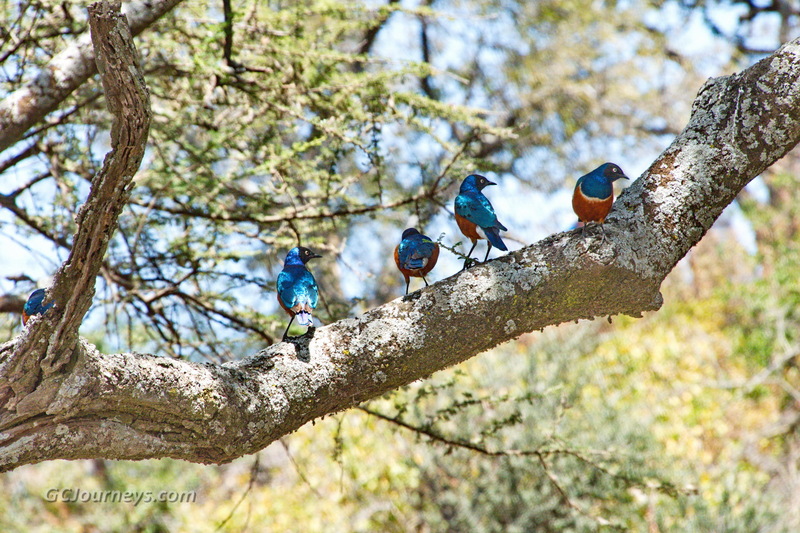 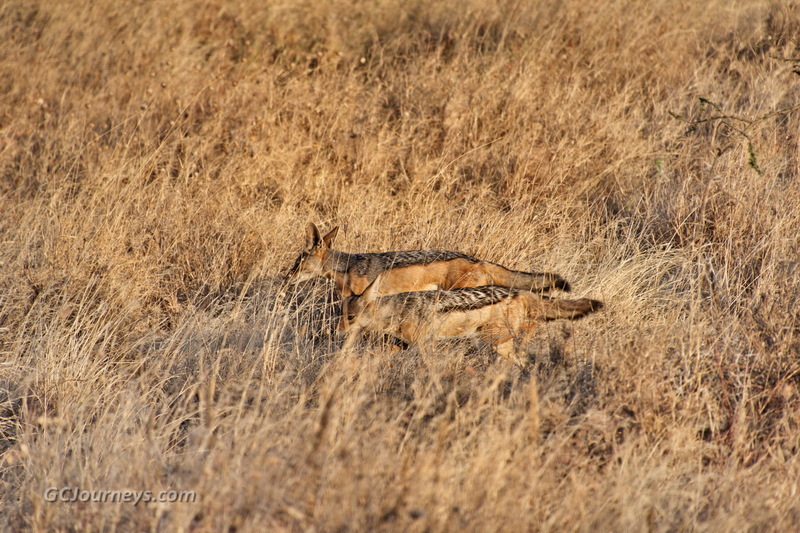 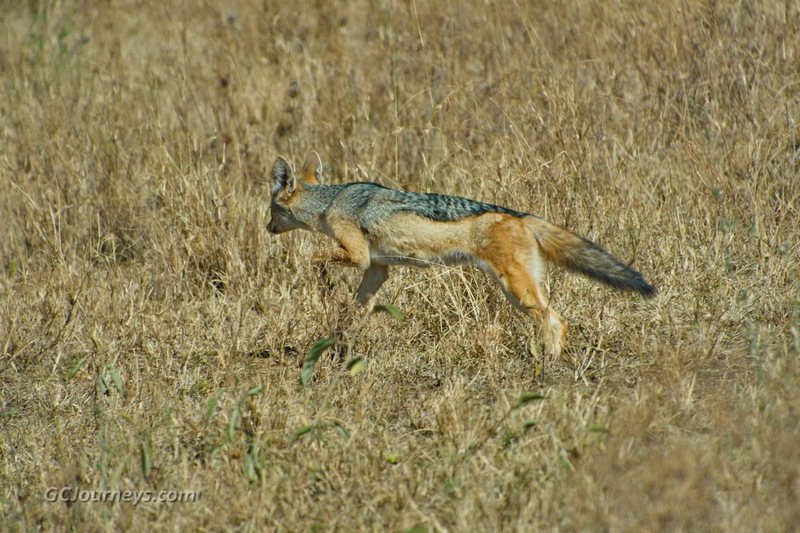 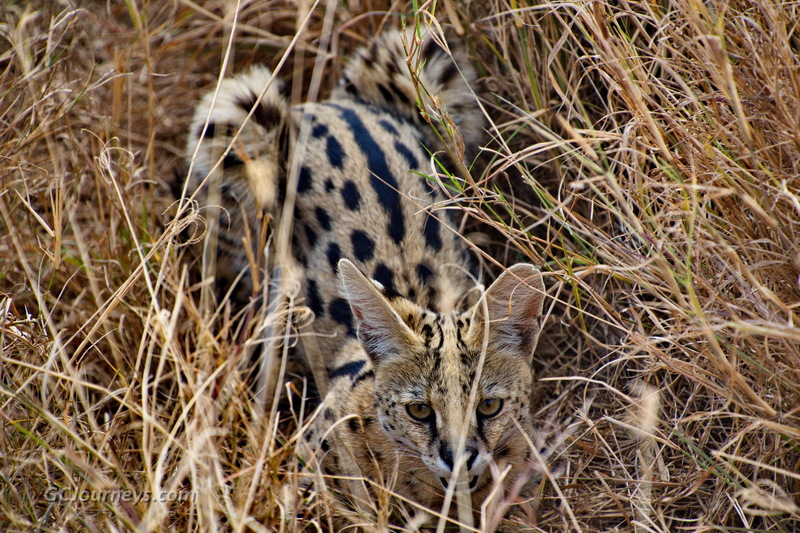 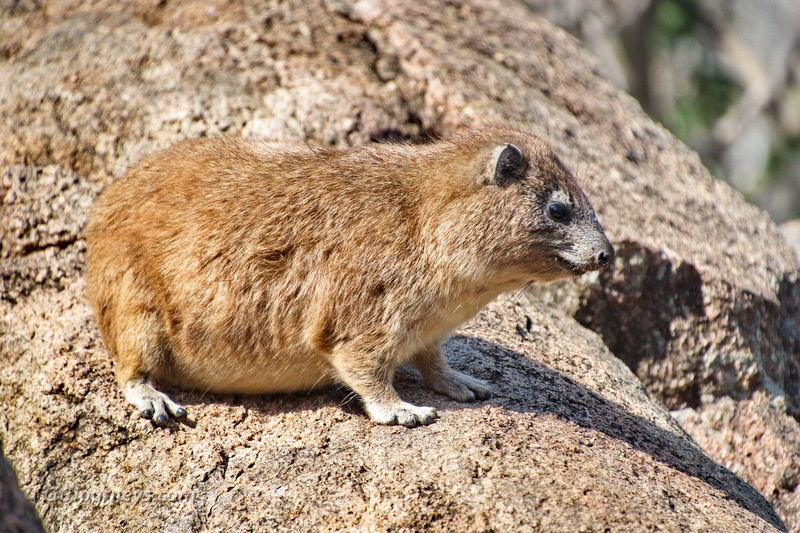 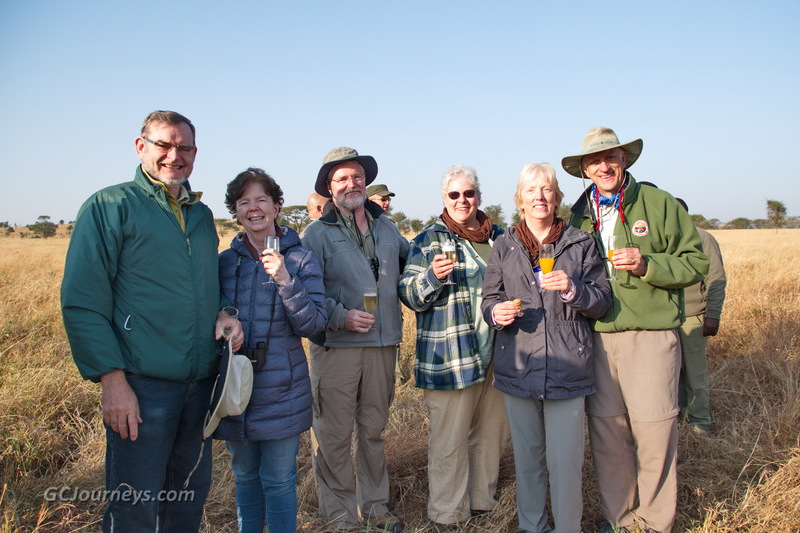 We also saw many other animals, including some large elephant families, another cheetah, more hippos, giraffes, rock hyrax, hyenas, topi, eland, baboons, gazelles, buffalo and a first-time sighting of a serval, a small (by African standards) cat, as well as secretary birds and a tawny eagle. 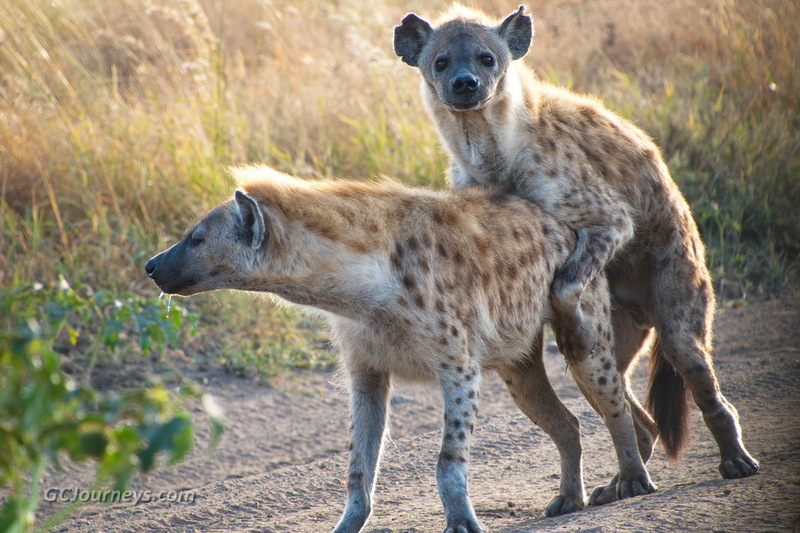 Our early morning trip out of the Serengeti the next day was interrupted by a pair of amorous hyenas in the middle of the one-lane dirt road. 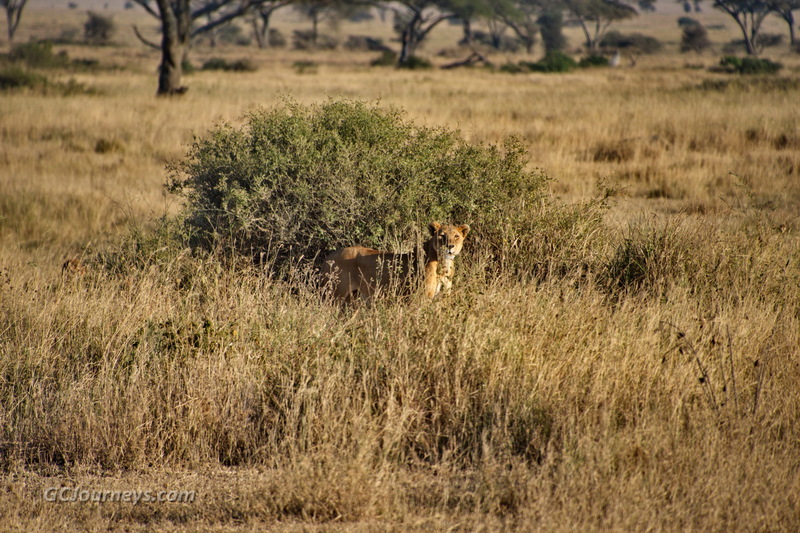 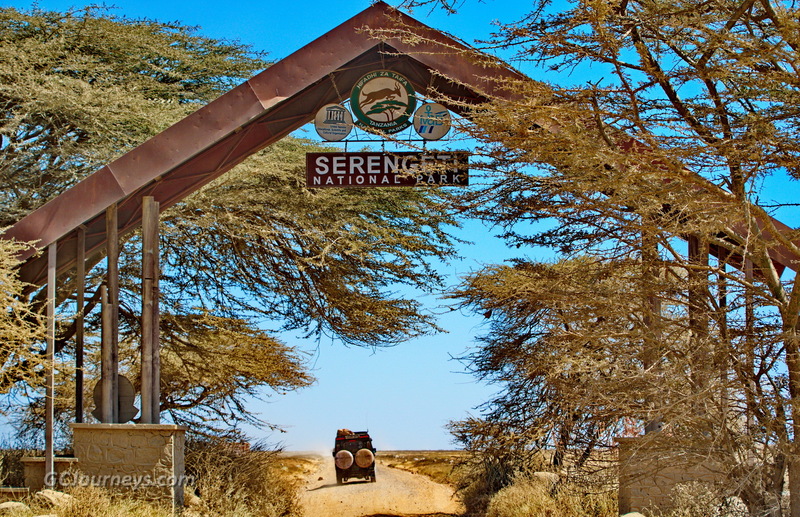 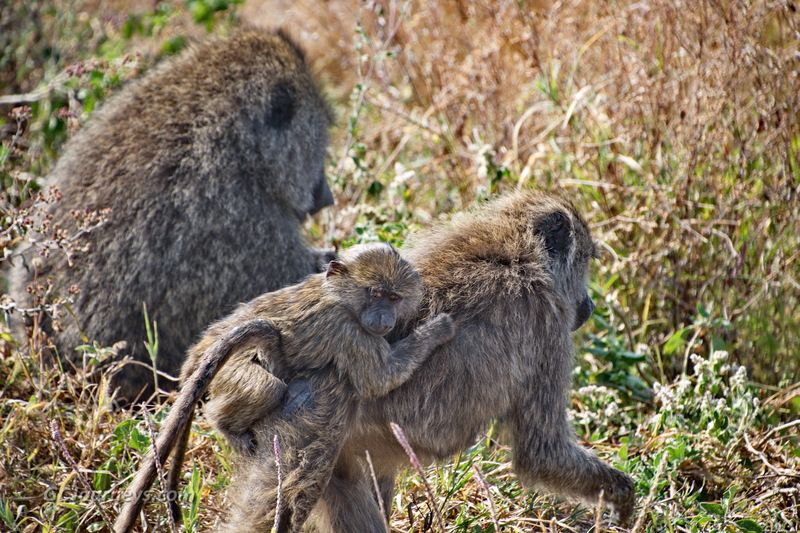 After they eventually finished their activity and stepped aside, we continued on the long, dusty, bumpy road out of the national park and into the Ngorongoro Crater. 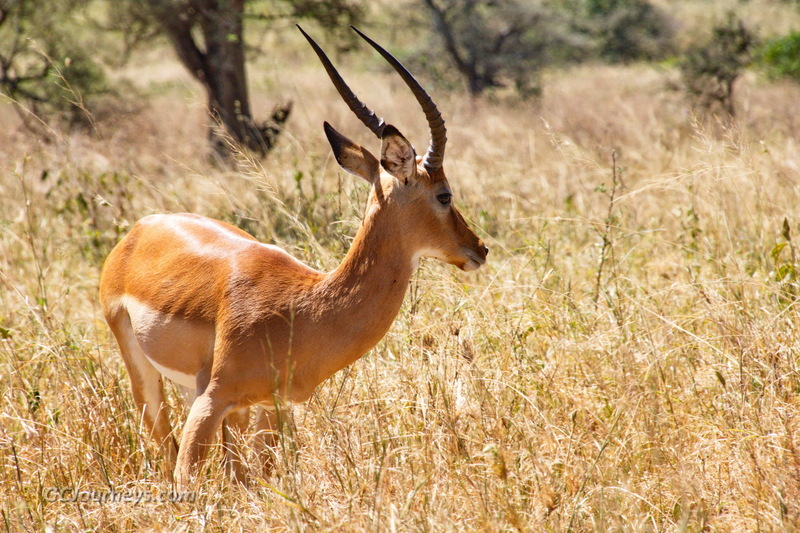 Touch or click on any thumbnail image to see a photo. 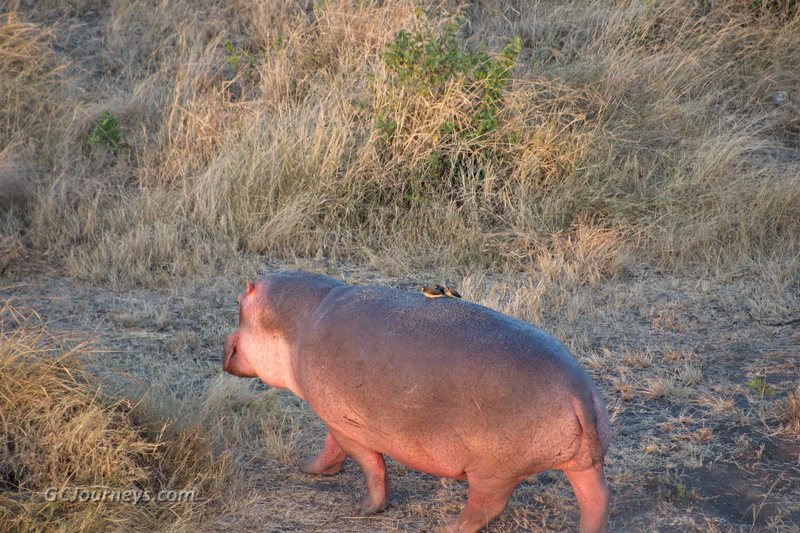 Then touch or click the Play icon (>) at upper right of the photo to run a slideshow.